At Supercomputing 2018 in Dallas, TX, AWS announced AWS Batch support for running tightly coupled workloads in a multi-node parallel jobs environment. This AWS Batch feature enables applications that require strong scaling for efficient computational workloads. 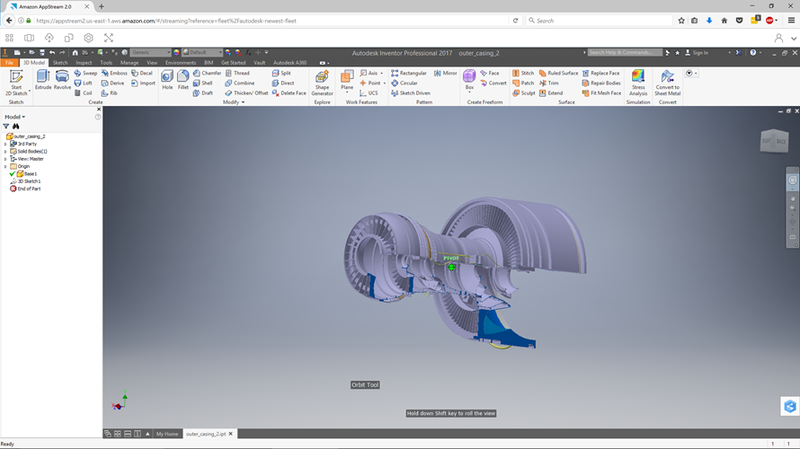 Some of the more popular workloads that can take advantage of this feature enhancement include computational fluid dynamics (CFD) codes such as OpenFoam, Fluent, and ANSYS. Other workloads include molecular dynamics (MD) applications such as AMBER, GROMACS, NAMD. Running tightly coupled, distributed, deep learning frameworks is also now possible on AWS Batch. Applications that can take advantage include TensorFlow, MXNet, Pytorch, and Chainer. Essentially, any application scaling that benefits from tightly coupled–based scalability can now be integrated into AWS Batch. In this post, we show you how to build a workflow executing an MD simulation using GROMACS running on GPUs, using the p3 instance family. AWS Batch is a service providing managed planning, scheduling, and execution of containerized workloads on AWS. Purpose-built for scalable compute workloads, AWS Batch is ideal for high throughput, distributed computing jobs such as video and image encoding, loosely coupled numerical calculations, and multistep computational workflows. If you are new to AWS Batch, consider gaining familiarity with the service by following the tutorial in the Creating a Simple “Fetch & Run” AWS Batch Job post. Launch an ECS instance, p3.2xlarge with a NVIDIA Tesla V100 backend. Use the Amazon Linux 2 AMIs for ECS. In the ECS instance, install the latest CUDA 10 stack, which provides the toolchain and compilation libraries as well as the NVIDIA driver. In your /etc/docker/daemon.json file, ensure that the default-runtime value is set to nvidia. 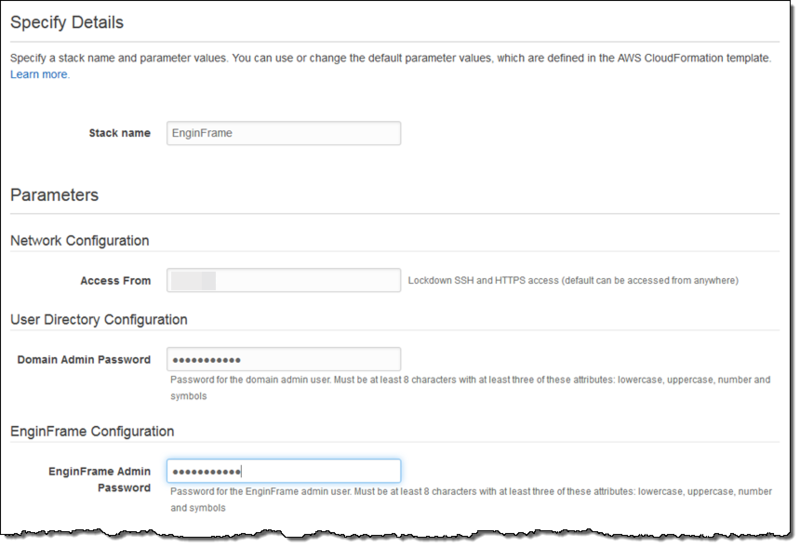 Finally, save the EC2 instance as an AMI in your account. Copy the AMI ID, as you need it later in the post. In a production environment, it’s important to efficiently execute the compute workload with multi-node parallel jobs. Most of the optimization is on the application layer and how efficiently the Message Passing Interface (MPI) ranks (MPI and OpenMP threads) are distributed across nodes. Application-level optimization is out of scope for this post, but should be considered when running in production. One of the key requirements for running on AWS Batch is a Dockerized image with the application, libraries, scripts, and code. For multi-node parallel jobs, you need an MPI stack for the tightly coupled communication layer and a wrapper script for the MPI orchestration. The running child Docker containers need to pass container IP address information to the master node to fill out the MPI host file. The undifferentiated heavy lifting that AWS Batch provides is the Docker-to-Docker communication across nodes using Amazon ECS task networking. With multi-node parallel jobs, the ECS container receives environmental variables from the backend, which can be used to establish which running container is the master and which is the child. AWS_BATCH_JOB_MAIN_NODE_INDEX—The designation of the master node in a multi-node parallel job. This is the main node in which the MPI job is launched. AWS_BATCH_JOB_MAIN_NODE_PRIVATE_IPV4_ADDRESS—The IPv4 address of the main node. This is presented in the environment for all children nodes. AWS_BATCH_JOB_NODE_INDEX—The designation of the node index. AWS_BATCH_JOB_NUM_NODES – The number of nodes launched as part of the node group for your multi-node parallel job. If AWS_BATCH_JOB_MAIN_NODE_INDEX = AWS_BATCH_JOB_NODE_INDEX, then this is the main node. The following code block is an example MPI synchronization script that you can include as part of the CMD structure of the Docker container. Save the following code as mpi-run.sh. log "Running synchronize as the main node"
log "Running as master node"
log "master details -> $ip:$availablecores"
log "$lines out of $AWS_BATCH_JOB_NUM_NODES nodes joined, check again in 1 second"
log "All nodes successfully joined"
# remove duplicates if there are any. log "executing main MPIRUN workflow"
$AWS_BATCH_EXIT_CODE_FILE and shutting down my supervisord"
echo "Sleeping 5 seconds and trying again"
usage "Could not determine node type. Expected (main/child)"
The synchronization script supports downloading the assets from Amazon S3 as well as preparing the MPI host file based on GPU scheduling for GROMACS. Set up a passwordless-ssh keygen. Download, and compile OpenMPI. In this Dockerfile, you are downloading the recently released OpenMPI 4.0.0 source and compiling on a NVIDIA Tesla V100 GPU-backed instance (p3.2xlarge). Set up supervisor to run SSH at Docker container startup as well as processing the mpi-run.sh script as the CMD. ENV NOTVISIBLE "in users profile"
After the container is built, push the image to your Amazon ECR repository and note the container image URI for later steps. For the input files, use the Chalcone Synthase (1CGZ) example, from RCSB.org. 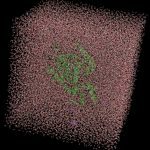 For this post, just run a simple simulation following the Lysozyme in Water GROMACS tutorial. 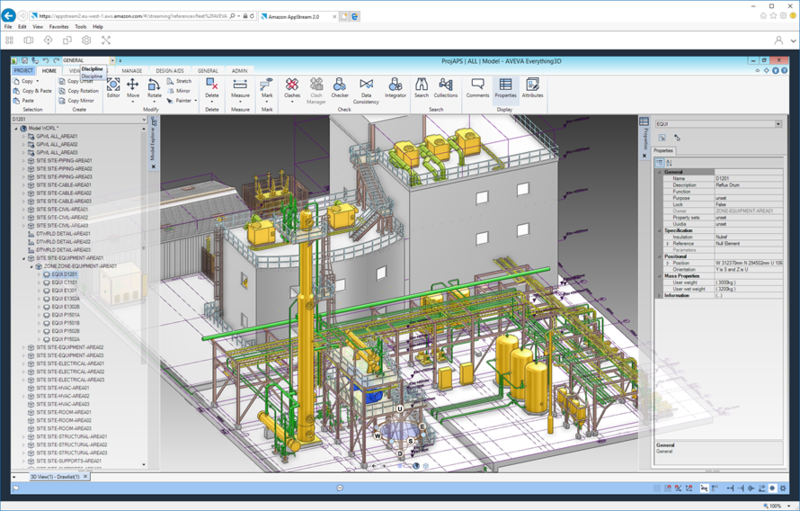 Execute the production MD run before the analysis (that is, after the system is solvated, neutralized, and equilibrated), so you can show that the longest part of the simulation can be achieved in a containizered workflow. It is possible from the tutorial to run the entire workflow from PDB preparation to solvation, and energy minimization and analysis in AWS Batch. For the purpose of running the MD simulation in this test case, use two p3.2xlarge instances. Each instance provides one NVIDIA Tesla V100 GPU for which GROMACS distributes the job. You don’t have to launch specific instance types. With the p3 family, the MPI-wrapper can concomitantly modify the MPI ranks to accommodate the current GPU and node topology. When the job is executed, instantiate two MPI processes with two OpenMP threads per MPI process. For this post, launch EC2 OnDemand, using the Amazon Linux AMIs we can take advantage of per-second billing. AWSBatchServiceRole—Allows AWS Batch to make EC2 calls on your behalf. ecsInstanceRole—Allows the underlying instance to make AWS API calls. For Enable user-specified Ami ID and enter the AMI that you created earlier. Finally, for the compute environment, specify the network VPC and subnets for launching the instances, as well as a security group. We recommend specifying a placement group for tightly coupled workloads for better performance. 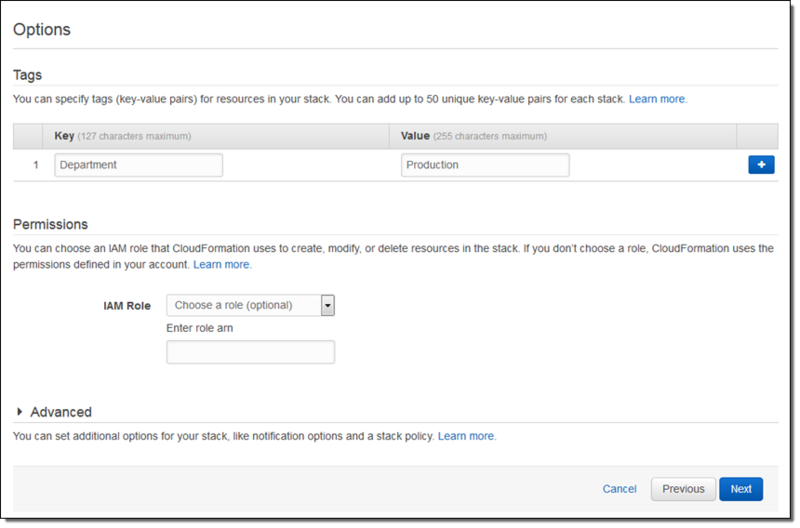 You can also create EC2 tags for the launch instances. We used name=gromacs-gpu-processor. 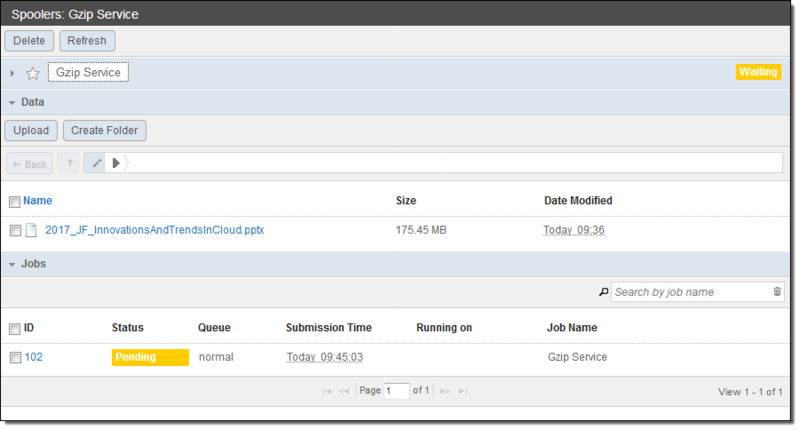 Next, choose Job Queues and create a gromacs-queue queue coupled with the compute environment created earlier. Set the priority to 1 and select Enable job queue. In the job definition setup, you create a two-node group, where each node pulls the gromacs_mpi image. Because you are using the p3.2xlarge instance providing one V100 GPU per instance, your vCPU slots = 8 for scheduling purposes. "value": "gmx_mpi mdrun -deffnm md_0_1 -nb gpu -ntomp 1"
In the AWS Batch job submission portal, provide a job name and select the job definition created earlier as well as the job queue. Ensure that the vCPU value is set to 8 and the Memory (MiB) value is 24000. Under Environmental Variables, within in each node group, ensure that the keys are set correctly as follows. Submit the job and wait for it to enter into the RUNNING state. After the job is in the RUNNING state, select the job ID and choose Nodes. 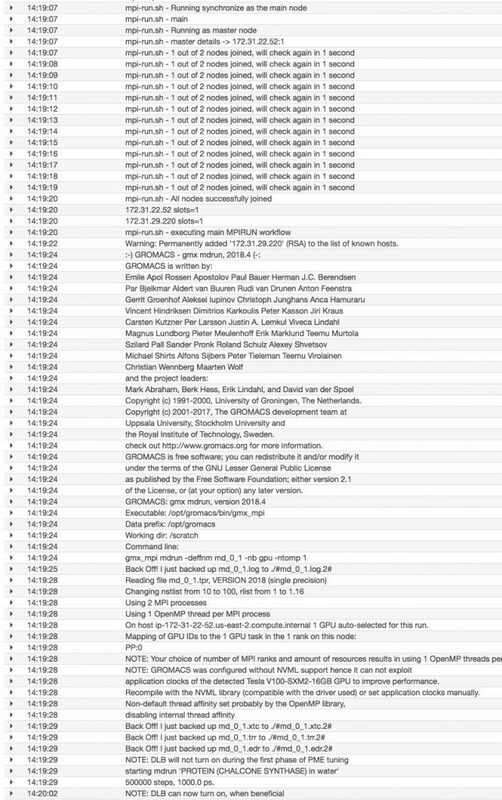 The containers listed each write to a separate Amazon CloudWatch log stream where you can monitor the progress. After the job is completed the entire working directory is compressed and uploaded to S3, the trajectories (*.xtc) and input .gro files can be viewed in your favorite MD analysis package. For more information about preparing a desktop, see Deploying a 4x4K, GPU-backed Linux desktop instance on AWS. You can view the trajectories in PyMOL as well as running any subsequent trajectory analysis. 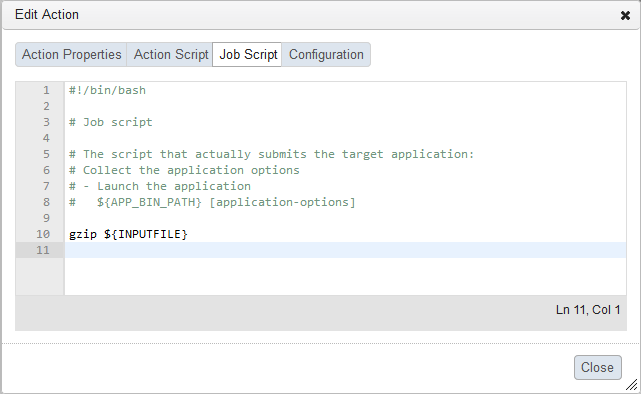 As we mentioned earlier, you can take this core workload and extend it as part of a job execution chain in a workflow. Native support for job dependencies exists in AWS Batch and alternatively in AWS Step Functions. With Step Functions, you can create a decision-based workflow tree to run the preparation, solvation, energy minimization, equilibration, production MD, and analysis. In this post, we showed that tightly coupled, scalable MD simulations can be executed using the recently released multi-node parallel jobs feature for AWS Batch. You finally have an end-to-end solution for distributed and MPI-based workloads. As we mentioned earlier, many other applications can also take advantage of this feature set. We invite you to try this out and let us know how it goes. Want to discuss how your tightly coupled workloads can benefit on AWS Batch? Contact AWS. When you execute high performance computing (HPC) workflows on AWS, you can take advantage of the elasticity and concomitant scale associated with recruiting resources for your computational workloads. AWS offers a variety of services, solutions, and open source tools to deploy, manage, and dynamically destroy compute resources for running various types of HPC workloads. Best practices in deploying HPC resources on AWS include creating much of the infrastructure on-demand, and making it as ephemeral and dynamic as possible. Traditional HPC clusters use a resource scheduler that maintains a set of computational resources and distributes those resources over a collection of queued jobs. With a central resource scheduler, all users have a single point of entry to a broad range of compute. Traditionally, many of these schedulers managed on-premises systems. They weren’t offered dynamically as much as cloud-based HPC clusters, and they usually only needed to manage a largely static set of resources. Simple Linux Resource Manager (SLURM) by SchedMD is one such popular scheduler. Using a derivative of SLURM’s elastic power plugin, you can coordinate the launch of a set of compute nodes with the appropriate CPU/disk/GPU/network topologies. You standup the compute resources for the job, instead of trying to fit a job within a set of pre-existing compute topologies. We have recently released an example implementation of the SLURM bursting capability in the AWS Samples GitHub repo. The following diagram shows the reference architecture. Download the aws-plugin-for-slurm directory locally. Use the following AWS CLI commands to sync the directory with an S3 bucket to be referenced later. For more detailed instructions on the deployment follow the README within the GitHub. Included is a CloudFormation script, which you use to stand up the VPC and subnets, as well as the headnode. In AWS CloudFormation, choose Create Stack and import the slurm_headnode-clouformation.yml script. The CloudFormation script lays down the landing zone with the appropriate network topology. The headnode is based on the publicly available CentOS 7.5 available in the AWS Marketplace. The latest security packages are installed with the dependencies needed to install SLURM. I have found that scheduling performance is best if the source is compiled at runtime, which the CloudFormation script takes care of. The script sets up the headnode as a single controller. However, with minor modifications, it can be set up in a highly available manner with a backup SLURM controller. This job submission script requests two nodes to be allocated, running one task per node and using four CPUs. The constraint is optional but allows SLURM to allocate the job among the available zones. The elasticity of the cluster comes in setting the slurm.conf parameters SuspendProgram and ResumeProgram in the slurm.conf file. You can set the responsiveness of the scaling on AWS by modifying SuspendTime. Do not set a value for ResumeRateor SuspendRate, as the underlying SuspendProgram and ResumeProgramscripts have API calls that impose their own rate limits. If you find that your API call rate limit is reached at scale (approximately 1000 nodes/sec), you can set ResumeRate and SuspendRate accordingly. If you are familiar with SLURM’s configuration options, you can make further modifications by editing the /nfs/slurm/etc/slurm.conf.d/slurm_nodes.conffile. That file contains the node definitions, with some minor modifications. You can schedule GPU-based workloads separate from CPU to instantiate a heterogeneous cluster layout. You also get more flexibility running tightly coupled workloads alongside loosely coupled jobs, as well as job array support. For additional commands administrating the SLURM cluster, see the SchedMD SLURM documentation. The power plugin allocates the requested number of nodes based on your job definition and runs the Amazon EC2 API operations to request those instances. The log file is located at /var/log/power_save.log. After the request job is complete, the compute nodes remain idle for the duration of the SuspendTime=60value in the slurm.conffile. Ideally, ensure that other queued jobs have an opportunity to run on the current infrastructure, assuming that the job requirements are fulfilled by the compute nodes. If the job requirements are not fulfilled and there are no more jobs in the queue, the aws-slurm shutdown script takes over and terminates the instance. That’s one of the benefits of an elastic cluster. The SLURM elastic compute plugin provisions the compute resources based on the scheduler queue load. In this example implementation, you are distributing a set of compute nodes to take advantage of scale and capacity across all Availability Zones within an AWS Region. With a minor modification on the VPC layer, you can use this same plugin to stand up compute resources across multiple Regions. With this implementation, you can truly take advantage of a global HPC footprint. “Imagine creating your own custom cluster mix of GPUs, CPUs, storage, memory, and networking – just the way you want it, then running your experiment, getting the results, and then tearing it all down.” — InsideHPC. Innovation Unbound: What Would You do with a Million Cores? In Part 2 of this post series, you integrate this cluster with AWS native services to handle scalable job submission and monitoring using Amazon API Gateway, AWS Lambda, and Amazon CloudWatch. As you can see from my EC2 Instance History post, we add new instance types on a regular and frequent basis. Driven by increasingly powerful processors and designed to address an ever-widening set of use cases, the size and diversity of this list reflects the equally diverse group of EC2 customers! Near the bottom of that list you will find the new compute-intensive C5 instances. With a 25% to 50% improvement in price-performance over the C4 instances, the C5 instances are designed for applications like batch and log processing, distributed and or real-time analytics, high-performance computing (HPC), ad serving, highly scalable multiplayer gaming, and video encoding. Some of these applications can benefit from access to high-speed, ultra-low latency local storage. For example, video encoding, image manipulation, and other forms of media processing often necessitates large amounts of I/O to temporary storage. While the input and output files are valuable assets and are typically stored as Amazon Simple Storage Service (S3) objects, the intermediate files are expendable. Similarly, batch and log processing runs in a race-to-idle model, flushing volatile data to disk as fast as possible in order to make full use of compute resources. Other than the addition of local storage, the C5 and C5d share the same specs. Both are powered by 3.0 GHz Intel Xeon Platinum 8000-series processors, optimized for EC2 and with full control over C-states on the two largest sizes, giving you the ability to run two cores at up to 3.5 GHz using Intel Turbo Boost Technology. C5d instances are available in On-Demand, Reserved Instance, and Spot form in the US East (N. Virginia), US West (Oregon), EU (Ireland), US East (Ohio), and Canada (Central) Regions. Prices vary by Region, and are just a bit higher than for the equivalent C5 instances. PS – We will be adding local NVMe storage to other EC2 instance types in the months to come, so stay tuned! Join us this month to learn about some of the exciting new services and solution best practices at AWS. We also have our first re:Invent 2018 webinar series, “How to re:Invent”. Sign up now to learn more, we look forward to seeing you. May 21, 2018 | 11:00 AM – 11:45 AM PT – Integrating Amazon Elasticsearch with your DevOps Tooling – Learn how you can easily integrate Amazon Elasticsearch Service into your DevOps tooling and gain valuable insight from your log data. May 23, 2018 | 11:00 AM – 11:45 AM PT – Data Warehousing and Data Lake Analytics, Together – Learn how to query data across your data warehouse and data lake without moving data. May 24, 2018 | 11:00 AM – 11:45 AM PT – Data Transformation Patterns in AWS – Discover how to perform common data transformations on the AWS Data Lake. May 29, 2018 | 01:00 PM – 01:45 PM PT – Creating and Managing a WordPress Website with Amazon Lightsail – Learn about Amazon Lightsail and how you can create, run and manage your WordPress websites with Amazon’s simple compute platform. May 30, 2018 | 01:00 PM – 01:45 PM PT – Accelerating Life Sciences with HPC on AWS – Learn how you can accelerate your Life Sciences research workloads by harnessing the power of high performance computing on AWS. May 24, 2018 | 01:00 PM – 01:45 PM PT – Building Microservices with the 12 Factor App Pattern on AWS – Learn best practices for building containerized microservices on AWS, and how traditional software design patterns evolve in the context of containers. May 21, 2018 | 01:00 PM – 01:45 PM PT – How to Migrate from Cassandra to Amazon DynamoDB – Get the benefits, best practices and guides on how to migrate your Cassandra databases to Amazon DynamoDB. May 23, 2018 | 01:00 PM – 01:45 PM PT – 5 Hacks for Optimizing MySQL in the Cloud – Learn how to optimize your MySQL databases for high availability, performance, and disaster resilience using RDS. May 23, 2018 | 09:00 AM – 09:45 AM PT – .NET Serverless Development on AWS – Learn how to build a modern serverless application in .NET Core 2.0. May 22, 2018 | 11:00 AM – 11:45 AM PT – Hybrid Cloud Customer Use Cases on AWS – Learn how customers are leveraging AWS hybrid cloud capabilities to easily extend their datacenter capacity, deliver new services and applications, and ensure business continuity and disaster recovery. May 31, 2018 | 11:00 AM – 11:45 AM PT – Using AWS IoT for Industrial Applications – Discover how you can quickly onboard your fleet of connected devices, keep them secure, and build predictive analytics with AWS IoT. May 22, 2018 | 09:00 AM – 09:45 AM PT – Using Apache Spark with Amazon SageMaker – Discover how to use Apache Spark with Amazon SageMaker for training jobs and application integration. May 24, 2018 | 09:00 AM – 09:45 AM PT – Introducing AWS DeepLens – Learn how AWS DeepLens provides a new way for developers to learn machine learning by pairing the physical device with a broad set of tutorials, examples, source code, and integration with familiar AWS services. May 21, 2018 | 09:00 AM – 09:45 AM PT – Gaining Better Observability of Your VMs with Amazon CloudWatch – Learn how CloudWatch Agent makes it easy for customers like Rackspace to monitor their VMs. May 29, 2018 | 11:00 AM – 11:45 AM PT – Deep Dive on Amazon Pinpoint Segmentation and Endpoint Management – See how segmentation and endpoint management with Amazon Pinpoint can help you target the right audience. May 31, 2018 | 09:00 AM – 09:45 AM PT – Making Private Connectivity the New Norm via AWS PrivateLink – See how PrivateLink enables service owners to offer private endpoints to customers outside their company. May 30, 2018 | 09:00 AM – 09:45 AM PT – Introducing AWS Certificate Manager Private Certificate Authority (CA) – Learn how AWS Certificate Manager (ACM) Private Certificate Authority (CA), a managed private CA service, helps you easily and securely manage the lifecycle of your private certificates. June 1, 2018 | 09:00 AM – 09:45 AM PT – Introducing AWS Firewall Manager – Centrally configure and manage AWS WAF rules across your accounts and applications. May 22, 2018 | 01:00 PM – 01:45 PM PT – Building API-Driven Microservices with Amazon API Gateway – Learn how to build a secure, scalable API for your application in our tech talk about API-driven microservices. May 30, 2018 | 11:00 AM – 11:45 AM PT – Accelerate Productivity by Computing at the Edge – Learn how AWS Snowball Edge support for compute instances helps accelerate data transfers, execute custom applications, and reduce overall storage costs. June 1, 2018 | 11:00 AM – 11:45 AM PT – Learn to Build a Cloud-Scale Website Powered by Amazon EFS – Technical deep dive where you’ll learn tips and tricks for integrating WordPress, Drupal and Magento with Amazon EFS. We have several upcoming tech talks in the month of April and early May. Come join us to learn about AWS services and solution offerings. We’ll have AWS experts online to help answer questions in real-time. Sign up now to learn more, we look forward to seeing you. April 30, 2018 | 01:00 PM – 01:45 PM PT – Best Practices for Running Amazon EC2 Spot Instances with Amazon EMR (300) – Learn about the best practices for scaling big data workloads as well as process, store, and analyze big data securely and cost effectively with Amazon EMR and Amazon EC2 Spot Instances. May 1, 2018 | 01:00 PM – 01:45 PM PT – How to Bring Microsoft Apps to AWS (300) – Learn more about how to save significant money by bringing your Microsoft workloads to AWS. May 2, 2018 | 01:00 PM – 01:45 PM PT – Deep Dive on Amazon EC2 Accelerated Computing (300) – Get a technical deep dive on how AWS’ GPU and FGPA-based compute services can help you to optimize and accelerate your ML/DL and HPC workloads in the cloud. April 23, 2018 | 11:00 AM – 11:45 AM PT – New Features for Building Powerful Containerized Microservices on AWS (300) – Learn about how this new feature works and how you can start using it to build and run modern, containerized applications on AWS. April 23, 2018 | 01:00 PM – 01:45 PM PT – ElastiCache: Deep Dive Best Practices and Usage Patterns (200) – Learn about Redis-compatible in-memory data store and cache with Amazon ElastiCache. April 25, 2018 | 01:00 PM – 01:45 PM PT – Intro to Open Source Databases on AWS (200) – Learn how to tap the benefits of open source databases on AWS without the administrative hassle. April 25, 2018 | 09:00 AM – 09:45 AM PT – Debug your Container and Serverless Applications with AWS X-Ray in 5 Minutes (300) – Learn how AWS X-Ray makes debugging your Container and Serverless applications fun. April 23, 2018 | 09:00 AM – 09:45 AM PT – An Overview of Best Practices of Large-Scale Migrations (300) – Learn about the tools and best practices on how to migrate to AWS at scale. May 2, 2018 | 11:00 AM – 11:45 AM PT – How to Easily and Securely Connect Devices to AWS IoT (200) – Learn how to easily and securely connect devices to the cloud and reliably scale to billions of devices and trillions of messages with AWS IoT. April 24, 2018 | 09:00 AM – 09:45 AM PT – Automate for Efficiency with Amazon Transcribe and Amazon Translate (200) – Learn how you can increase the efficiency and reach your operations with Amazon Translate and Amazon Transcribe. April 26, 2018 | 09:00 AM – 09:45 AM PT – Perform Machine Learning at the IoT Edge using AWS Greengrass and Amazon Sagemaker (200) – Learn more about developing machine learning applications for the IoT edge. April 30, 2018 | 11:00 AM – 11:45 AM PT – Offline GraphQL Apps with AWS AppSync (300) – Come learn how to enable real-time and offline data in your applications with GraphQL using AWS AppSync. May 2, 2018 | 09:00 AM – 09:45 AM PT – Taking Serverless to the Edge (300) – Learn how to run your code closer to your end users in a serverless fashion. Also, David Von Lehman from Aerobatic will discuss how they used [email protected] to reduce latency and cloud costs for their customer’s websites. April 30, 2018 | 09:00 AM – 09:45 AM PT – Amazon GuardDuty – Let’s Attack My Account! (300) – Amazon GuardDuty Test Drive – Practical steps on generating test findings. May 3, 2018 | 09:00 AM – 09:45 AM PT – Protect Your Game Servers from DDoS Attacks (200) – Learn how to use the new AWS Shield Advanced for EC2 to protect your internet-facing game servers against network layer DDoS attacks and application layer attacks of all kinds. April 24, 2018 | 01:00 PM – 01:45 PM PT – Tips and Tricks for Building and Deploying Serverless Apps In Minutes (200) – Learn how to build and deploy apps in minutes. May 1, 2018 | 11:00 AM – 11:45 AM PT – Building Data Lakes That Cost Less and Deliver Results Faster (300) – Learn how Amazon S3 Select And Amazon Glacier Select increase application performance by up to 400% and reduce total cost of ownership by extending your data lake into cost-effective archive storage. May 3, 2018 | 11:00 AM – 11:45 AM PT – Integrating On-Premises Vendors with AWS for Backup (300) – Learn how to work with AWS and technology partners to build backup & restore solutions for your on-premises, hybrid, and cloud native environments. 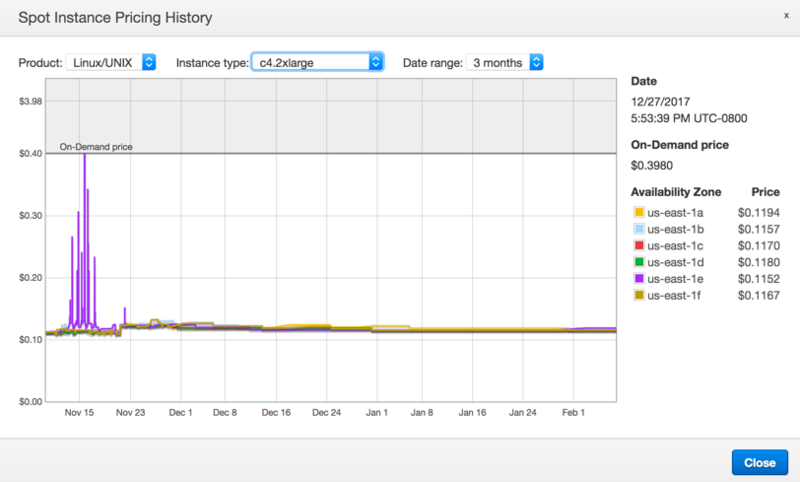 Amazon EC2 Spot Instances offer spare compute capacity in the AWS Cloud at steep discounts. Customers—including Yelp, NASA JPL, FINRA, and Autodesk—use Spot Instances to reduce costs and get faster results. Spot Instances provide acceleration, scale, and deep cost savings to big data workloads, containerized applications such as web services, test/dev, and many types of HPC and batch jobs. At re:Invent 2017, we launched a new pricing model that simplified the Spot purchasing experience. The new model gives you predictable prices that adjust slowly over days and weeks, with typical savings of 70-90% over On-Demand. With the previous pricing model, some of you had to invest time and effort to analyze historical prices to determine your bidding strategy and maximum bid price. Not anymore. How does the new pricing model work? You don’t have to bid for Spot Instances in the new pricing model, and you just pay the Spot price that’s in effect for the current hour for the instances that you launch. It’s that simple. Now you can request Spot capacity just like you would request On-Demand capacity, without having to spend time analyzing market prices or setting a maximum bid price. Previously, Spot Instances were terminated in ascending order of bids, and the Spot price was set to the highest unfulfilled bid. The market prices fluctuated frequently because of this. In the new model, the Spot prices are more predictable, updated less frequently, and are determined by supply and demand for Amazon EC2 spare capacity, not bid prices. You can find the price that’s in effect for the current hour in the EC2 console. As you can see from the above Spot Instance Pricing History graph (available in the EC2 console under Spot Requests), Spot prices were volatile before the pricing model update. However, after the pricing model update, prices are more predictable and change less frequently. The default maximum price is the On-Demand price and you can continue to set a maximum Spot price of up to 10x the On-Demand price. That means, if you have been running applications on Spot Instances and use the RequestSpotInstances or RequestSpotFleet operations, you can continue to do so. The new Spot pricing model is backward compatible and you do not need to make any changes to your existing applications. Spot Instances receive a two-minute interruption notice when these instances are about to be reclaimed by EC2, because EC2 needs the capacity back. We have significantly reduced the interruptions with the new pricing model. Now instances are not interrupted because of higher competing bids, and you can enjoy longer workload runtimes. The typical frequency of interruption for Spot Instances in the last 30 days was less than 5% on average. To reduce the impact of interruptions and optimize Spot Instances, diversify and run your application across multiple capacity pools. Each instance family, each instance size, in each Availability Zone, in every Region is a separate Spot pool. You can use the RequestSpotFleet API operation to launch thousands of Spot Instances and diversify resources automatically. To further reduce the impact of interruptions, you can also set up Spot Instances and Spot Fleets to respond to an interruption notice by stopping or hibernating rather than terminating instances when capacity is no longer available. Spot Instances are now available in 18 Regions and 51 Availability Zones, and offer 100s of instance options. We have eliminated bidding, simplified the pricing model, and have made it easy to get started with Amazon EC2 Spot Instances for you to take advantage of the largest pool of cost-effective compute capacity in the world. See the Spot Instances detail page for more information and create your Spot Instance here. 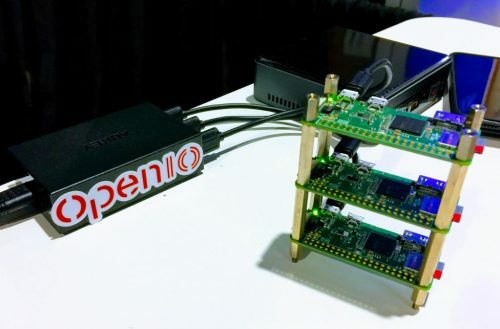 In today’s guest post, Bruce Tulloch, CEO and Managing Director of BitScope Designs, discusses the uses of cluster computing with the Raspberry Pi, and the recent pilot of the Los Alamos National Laboratory 3000-Pi cluster built with the BitScope Blade. 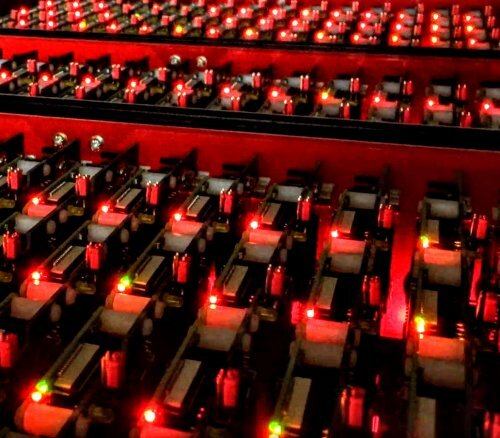 High-performance computing and Raspberry Pi are not normally uttered in the same breath, but Los Alamos National Laboratory is building a Raspberry Pi cluster with 3000 cores as a pilot before scaling up to 40 000 cores or more next year. 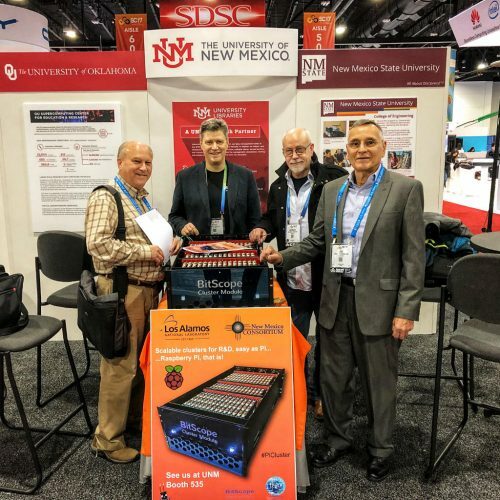 I was asked this question more than any other at The International Conference for High-Performance Computing, Networking, Storage and Analysis in Denver last week, where one of the Los Alamos Raspberry Pi Cluster Modules was on display at the University of New Mexico’s Center for Advanced Research Computing booth. The short answer to this question is: the Raspberry Pi cluster enables Los Alamos National Laboratory (LANL) to conduct exascale computing R&D. Exascale refers to computing systems at least 50 times faster than the most powerful supercomputers in use today. The problem faced by LANL and similar labs building these things is one of scale. To get the required performance, you need a lot of nodes, and to make it work, you need a lot of R&D. However, there’s a catch-22: how do you write the operating systems, networks stacks, launch and boot systems for such large computers without having one on which to test it all? Use an existing supercomputer? No — the existing large clusters are fully booked 24/7 doing science, they cost millions of dollars per year to run, and they may not have the architecture you need for your next-generation machine anyway. Older machines retired from science may be available, but at this scale they cost far too much to use and are usually very hard to maintain. The Los Alamos solution? Build a “model supercomputer” with Raspberry Pi! Think of it as a “cluster development breadboard”. The idea is to design, develop, debug, and test new network architectures and systems software on the “breadboard”, but at a scale equivalent to the production machines you’re currently building. Raspberry Pi may be a small computer, but it can run most of the system software stacks that production machines use, and the ratios of its CPU speed, local memory, and network bandwidth scale proportionately to the big machines, much like an architect’s model does when building a new house. To learn more about the project, see the news conference and this interview with insideHPC at SC17. Like most people, we love a good cluster! People have been building them with Raspberry Pi since the beginning, because it’s inexpensive, educational, and fun. They’ve been built with the original Pi, Pi 2, Pi 3, and even the Pi Zero, but none of these clusters have proven to be particularly practical. That’s not stopped them being useful though! I saw quite a few Raspberry Pi clusters at the conference last week. 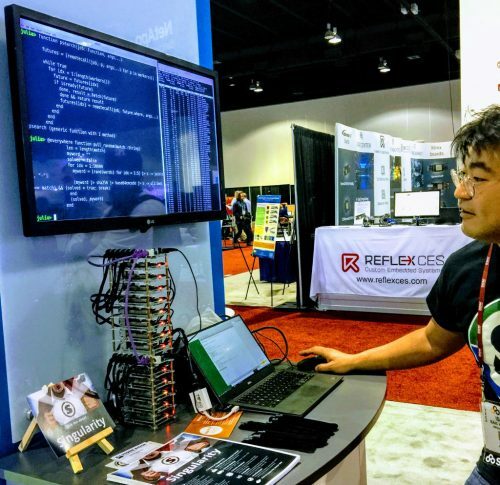 There was another appealing example at the ARM booth, where the Berkeley Labs’ singularity container platform was demonstrated running very effectively on a small cluster built with Raspberry Pi 3s. 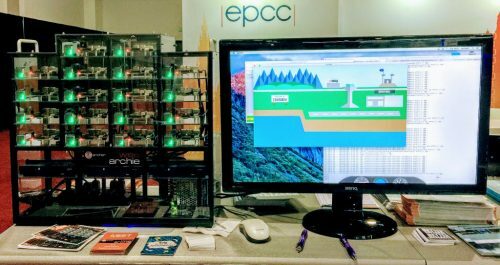 My show favourite was from the Edinburgh Parallel Computing Center (EPCC): Nick Brown used a cluster of Pi 3s to explain supercomputers to kids with an engaging interactive application. The idea was that visitors to the stand design an aircraft wing, simulate it across the cluster, and work out whether an aircraft that uses the new wing could fly from Edinburgh to New York on a full tank of fuel. Mine made it, fortunately! We’ve been building small-scale industrial-strength Raspberry Pi clusters for a while now with BitScope Blade. When Los Alamos National Laboratory approached us via HPC provider SICORP with a request to build a cluster comprising many thousands of nodes, we considered all the options very carefully. It needed to be dense, reliable, low-power, and easy to configure and to build. It did not need to “do science”, but it did need to work in almost every other way as a full-scale HPC cluster would. Some people argue Compute Module 3 is the ideal cluster building block. It’s very small and just as powerful as Raspberry Pi 3, so one could, in theory, pack a lot of them into a very small space. However, there are very good reasons no one has ever successfully done this. For a start, you need to build your own network fabric and I/O, and cooling the CM3s, especially when densely packed in a cluster, is tricky given their tiny size. There’s very little room for heatsinks, and the tiny PCBs dissipate very little excess heat. Instead, we saw the potential for Raspberry Pi 3 itself to be used to build “industrial-strength clusters” with BitScope Blade. It works best when the Pis are properly mounted, powered reliably, and cooled effectively. It’s important to avoid using micro SD cards and to connect the nodes using wired networks. It has the added benefit of coming with lots of “free” USB I/O, and the Pi 3 PCB, when mounted with the correct air-flow, is a remarkably good heatsink. Two of these packs, built with Blade Quattro, and one smaller one comprising 30 nodes, built with Blade Duo, are the components of the Cluster Module we exhibited at the show. Five of these modules are going into Los Alamos National Laboratory for their pilot as I write this. It’s not only research clusters like this for which Raspberry Pi is well suited. You can build very reliable local cloud computing and data centre solutions for research, education, and even some industrial applications. 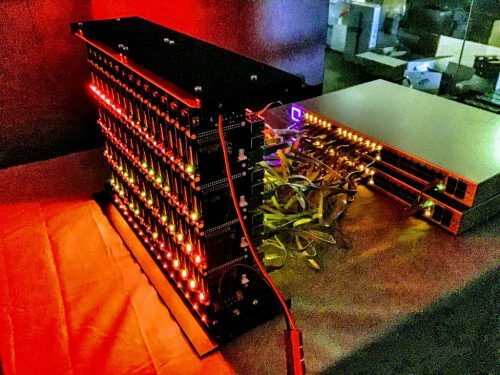 You’re not going to get much heavy-duty science, big data analytics, AI, or serious number crunching done on one of these, but it is quite amazing to see just how useful Raspberry Pi clusters can be for other purposes, whether it’s software-defined networks, lightweight MaaS, SaaS, PaaS, or FaaS solutions, distributed storage, edge computing, industrial IoT, and of course, education in all things cluster and parallel computing. For one live example, check out Mythic Beasts’ educational compute cloud, built with Raspberry Pi 3. For more information about Raspberry Pi clusters, drop by BitScope Clusters. I’ll read and respond to your thoughts in the comments below this post too. 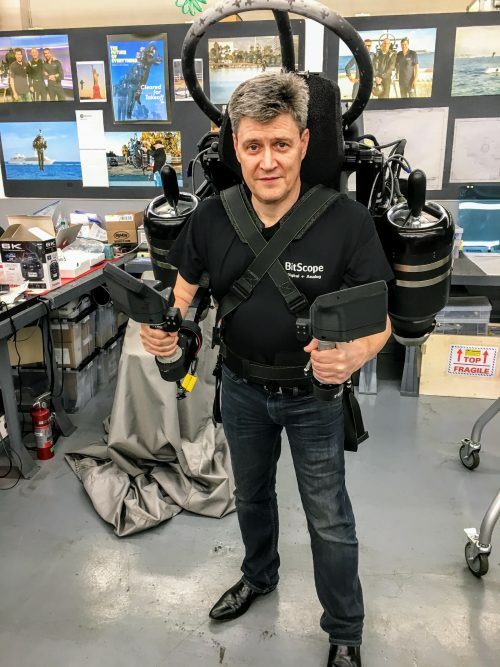 Here is a photo of Bruce wearing a jetpack. Cool, right?! The post Raspberry Pi clusters come of age appeared first on Raspberry Pi. Customers have been building their innovations on AWS for over 11 years. During that time, our solutions architects have conducted tens of thousands of architecture reviews for our customers. In 2012 we created the “Well-Architected” initiative to share with you best practices for building in the cloud, and started publishing them in 2015. We recently released an updated Framework whitepaper, and a new Operational Excellence Pillar whitepaper to reflect what we learned from working with customers every day. Today, we are pleased to announce a new concept called a “lens” that allows you to focus on specific workload types from the well-architected perspective. A well-architected review looks at a workload from a general technology perspective, which means it can’t provide workload-specific advice. For example, there are additional best practices when you are building high-performance computing (HPC) or serverless applications. Therefore, we created the concept of a lens to focus on what is different for those types of workloads. In each lens, we document common scenarios we see — specific to that workload — providing reference architectures and a walkthrough. The lens also provides design principles to help you understand how to architect these types of workloads for the cloud, and questions for assessing your own architecture. We expect to create more lenses over time, and evolve them based on customer feedback. I’m thrilled to announce that the new compute-intensive C5 instances are available today in six sizes for launch in three AWS regions! These instances designed for compute-heavy applications like batch processing, distributed analytics, high-performance computing (HPC), ad serving, highly scalable multiplayer gaming, and video encoding. The new instances offer a 25% price/performance improvement over the C4 instances, with over 50% for some workloads. They also have additional memory per vCPU, and (for code that can make use of the new AVX-512 instructions), twice the performance for vector and floating point workloads. Over the years we have been working non-stop to provide our customers with the best possible networking, storage, and compute performance, with a long-term focus on offloading many types of work to dedicated hardware designed and built by AWS. The C5 instance type incorporates the latest generation of our hardware offloads, and also takes another big step forward with the addition of a new hypervisor that runs hand-in-glove with our hardware. The new hypervisor allows us to give you access to all of the processing power provided by the host hardware, while also making performance even more consistent and further raising the bar on security. We’ll be sharing many technical details about it at AWS re:Invent. Each vCPU is a hardware hyperthread on a 3.0 GHz Intel Xeon Platinum 8000-series processor. This custom processor, optimized for EC2, allows you have full control over the C-states on the two largest sizes, allowing you to run a single core at up to 3.5 GHz using Intel Turbo Boost Technology. As you can see from the table, the four smallest instance sizes offer substantially more EBS and network bandwidth than the previous generation of compute-intensive instances. Because all networking and storage functionality is implemented in hardware, C5 instances require HVM AMIs that include drivers for the Elastic Network Adapter (ENA) and NVMe. The latest Amazon Linux, Microsoft Windows, Ubuntu, RHEL, CentOS, SLES, Debian, and FreeBSD AMIs all support C5 instances. If you are doing machine learning inferencing, or other compute-intensive work, be sure to check out the most recent version of the Intel Math Kernel Library. It has been optimized for the Intel® Xeon® Platinum processor and has the potential to greatly accelerate your work. With a little more work (and a lot of testing), you could create a script that expands EBS volumes that are getting full. CC1 – Launched in 2010, the CC1 was designed to support scale-out HPC applications. It was the first EC2 instance to support 10 Gbps networking and one of the first to support HVM virtualization. The network fabric that we designed for the CC1 (based on our own switch hardware) has become the standard for all AWS data centers. C3 – Launched in 2013, the C3 introduced Enhanced Networking and uses dedicated hardware accelerators to support the software defined network inside of each Virtual Private Cloud (VPC). Hardware virtualization removes the I/O stack from the hypervisor in favor of direct access by the guest OS, resulting in higher performance and reduced variability. C4 – Launched in 2015, the C4 instances are EBS Optimized by default via a dedicated network connection, and also offload EBS processing (including CPU-intensive crypto operations for encrypted EBS volumes) to a hardware accelerator. C5 – Launched today, the hypervisor that powers the C5 instances allow practically all of the resources of the host CPU to be devoted to customer instances. The ENA networking and the NVMe interface to EBS are both powered by hardware accelerators. The instances do not require (or support) the Xen paravirtual networking or block device drivers, both of which have been removed in order to increase efficiency. Going forward, we’ll use this hypervisor to power other instance types and plan to share additional technical details in a set of AWS re:Invent sessions. You can launch C5 instances today in the US East (Northern Virginia), US West (Oregon), and EU (Ireland) Regions in On-Demand and Spot form (Reserved Instances are also available), with additional Regions in the works. One quick note before I go: The current NVMe driver is not optimized for high-performance sequential workloads and we don’t recommend the use of C5 instances in conjunction with sc1 or st1 volumes. We are aware of this issue and have been working to optimize the driver for this important use case. In a prior post, Disabling Intel Hyper-Threading on Amazon Linux, I investigated how the Linux kernel enumerates CPUs. I also discussed the options to disable Intel Hyper-Threading (HT Technology) in Amazon Linux running on Amazon EC2. In this post, I do the same for Microsoft Windows Server 2016 running on EC2 instances. I begin with a quick review of HT Technology and the reasons you might want to disable it. I also recommend that you take a moment to review the prior post for a more thorough foundation. HT Technology makes a single physical processor appear as multiple logical processors. Each core in an Intel Xeon processor has two threads of execution. Most of the time, these threads can progress independently; one thread executing while the other is waiting on a relatively slow operation (for example, reading from memory) to occur. However, the two threads do share resources and occasionally one thread is forced to wait while the other is executing. There a few unique situations where disabling HT Technology can improve performance. One example is high performance computing (HPC) workloads that rely heavily on floating point operations. In these rare cases, it can be advantageous to disable HT Technology. However, these cases are rare, and for the overwhelming majority of workloads you should leave it enabled. I recommend that you test with and without HT Technology enabled, and only disable threads if you are sure it will improve performance. Here’s how Microsoft Windows enumerates CPUs. As before, I am running these examples on an m4.2xlarge. I also chose to run Windows Server 2016, but you can walk through these exercises on any version of Windows. Remember that the m4.2xlarge has eight vCPUs, and each vCPU is a thread of an Intel Xeon core. Therefore, the m4.2xlarge has four cores, each of which run two threads, resulting in eight vCPUs. As you can see from the screenshot, the coreinfo utility displays a table where each row is a physical core and each column is a logical CPU. In other words, the two asterisks on the first line indicate that CPU 0 and CPU 1 are the two threads in the first physical core. Therefore, my m4.2xlarge has for four physical processors and each processor has two threads resulting in eight total CPUs, just as expected. It is interesting to note that Windows Server 2016 enumerates CPUs in a different order than Linux. Remember from the prior post that Linux enumerated the first thread in each core, followed by the second thread in each core. You can see from the output earlier that Windows Server 2016, enumerates both threads in the first core, then both threads in the second core, and so on. The diagram below shows the relationship of CPUs to cores and threads in both operating systems. In the Linux post, I disabled CPUs 4–6, leaving one thread per core, and effectively disabling HT Technology. You can see from the diagram that you must disable the odd-numbered threads (that is, 1, 3, 5, and 7) to achieve the same result in Windows. Here’s how to do that. In Linux, you can globally disable CPUs dynamically. In Windows, there is no direct equivalent that I could find, but there are a few alternatives. First, you can disable CPUs using the msconfig.exe tool. 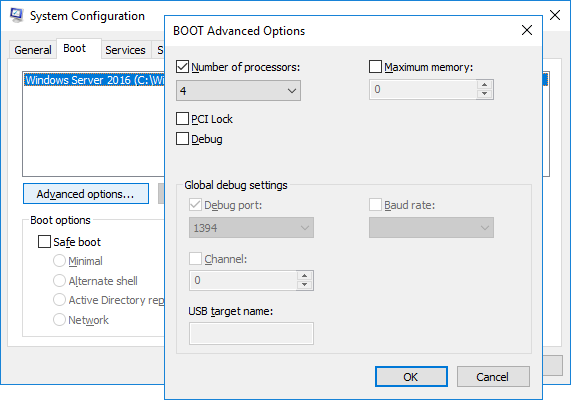 If you choose Boot, Advanced Options, you have the option to set the number of processors. In the example below, I limit my m4.2xlarge to four CPUs. Restart for this change to take effect. Unfortunately, Windows does not disable hyperthreaded CPUs first and then real cores, as Linux does. As you can see in the following output, coreinfo reports that my c4.2xlarge has two real cores and four hyperthreads, after rebooting. Msconfig.exe is useful for disabling cores, but it does not allow you to disable HT Technology. 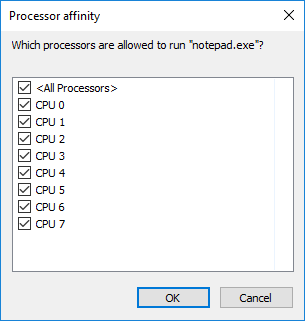 Note: If you have been following along, you can re-enable all your CPUs by unselecting the Number of processors check box and rebooting your system. While you cannot disable HT Technology systemwide, Windows does allow you to associate a particular process with one or more CPUs. Microsoft calls this, “processor affinity”. To see an example, use the following steps. Launch an instance of Notepad. Open Windows Task Manager and choose Processes. Open the context (right click) menu on notepad.exe and choose Set Affinity…. This brings up the Processor Affinity dialog box. The ProcessorAffinity attribute takes a bitmask in hexadecimal format. 0x55 in hex is equivalent to 01010101 in binary. Think of the binary encoding as 1=enabled and 0=disabled. This is slightly confusing, but we work left to right so that CPU 0 is the rightmost bit and CPU 7 is the leftmost bit. Therefore, 01010101 means that the first thread in each CPU is enabled just as it was in the diagram earlier. The calculator built into Windows includes a “programmer view” that helps you convert from hexadecimal to binary. In addition, the ProcessorAffinity attribute is a 64-bit number. Therefore, you can only configure the processor affinity on systems up to 64 CPUs. At the moment, only the x1.32xlarge has more than 64 vCPUs. In the preceding examples, you changed the processor affinity of a running process. Sometimes, you want to start a process with the affinity already configured. You can do this using the start command. The start command includes an affinity flag that takes a hexadecimal number like the PowerShell example earlier. It is interesting to note that a child process inherits the affinity from its parent. For example, the following commands create a batch file that launches Notepad, and starts the batch file with the affinity set. If you examine the instance of Notepad launched by the batch file, you see that the affinity has been applied to as well. This means that you can set the affinity of your task scheduler and any tasks that the scheduler starts inherits the affinity. So, you can disable every other thread when you launch the scheduler and effectively disable HT Technology for all of the tasks as well. Be sure to test this point, however, as some schedulers override the normal inheritance behavior and explicitly set processor affinity when starting a child process. While the Windows operating system does not allow you to disable logical CPUs, you can set processor affinity on individual processes. You also learned that Windows Server 2016 enumerates CPUs in a different order than Linux. Therefore, you can effectively disable HT Technology by restricting a process to every other CPU. Finally, you learned how to set affinity of both new and running processes using Task Manager, PowerShell, and the start command. Note: this technical approach has nothing to do with control over software licensing, or licensing rights, which are sometimes linked to the number of “CPUs” or “cores.” For licensing purposes, those are legal terms, not technical terms. This post did not cover anything about software licensing or licensing rights. Deriving insights from large datasets is central to nearly every industry, and life sciences is no exception. To combat the rising cost of bringing drugs to market, pharmaceutical companies are looking for ways to optimize their drug development processes. They are turning to big data analytics to better quantify the effect that their drug compounds have on different populations and to look for new clinical indications for existing drugs. A real world evidence (RWE) platform is loosely defined as an integrated set of services and products that life sciences companies use to securely acquire, store, and analyze large, often disparate datasets to gain insight into the functions of a specific drug or intervention. The petabyte-scale data generated from wearables, medical devices, genomics, clinical imaging, and claims (to name a few) allows pharmaceutical and other life sciences companies to build big data platforms to analyze these datasets. And many of them are doing it on AWS. At the center of nearly every RWE platform is a data lake that houses different data types. It also stores the related metadata to identify where each piece of data came from, who owned it, etc. Analytics engines integrate the relevant streaming (e.g., wearables), structured (e.g., claims data), and unstructured (e.g., notes in electronic health records) data. In this post, I highlight common architectural patterns that customers are using to maximize the value of real world evidence on AWS. The architecture presented here can be reproduced in multiple regions, so you can respect local data sovereignty requirements, when applicable, while conducting global studies. This post doesn’t cover all considerations for real world evidence (such as security and authentication), but instead focuses on the areas that are related to your data flow. A common solution to integrate these data types is a data lake. Data lakes allow organizations to store all their data, regardless of data type, in a centralized repository. Because data can be stored as-is, there’s no need to convert it to a predefined schema. And you no longer need to know what questions you want to ask of your data beforehand. You can use data lakes for ad hoc analyses, so you can quickly explore and discover new insights without needing to structure the data first, as you would with a traditional data warehouse. Quickly access all data for a given subject, from clinical images to genomics to claims data. Associate incoming RWE data with existing data in your RWE data lake, such as by subject or study. Select specific windows in longitudinal studies (microbiome, metabolomics, etc.). This architecture, which is entirely serverless and backed by Amazon S3, lets you scale your data lake to easily accommodate any data size for your RWE platform. Additionally, the components presented in this diagram can be secured via IAM controls and service policies. This enables you to secure and protect the sensitive information that often resides within an RWE platform. Amazon S3 is the canonical source for objects in your RWE data lake. You track and search metadata that is associated with these objects in a data catalog built on Amazon Elasticsearch Service and Amazon DynamoDB. Streaming (e.g., wearables), structured, and unstructured data is acquired from myriad devices and sources. Depending on the data size, you might use AWS IoT (streaming), AWS Storage Gateway (mid-size/continual batch), and AWS Snowball (large legacy datasets, such as imaging). 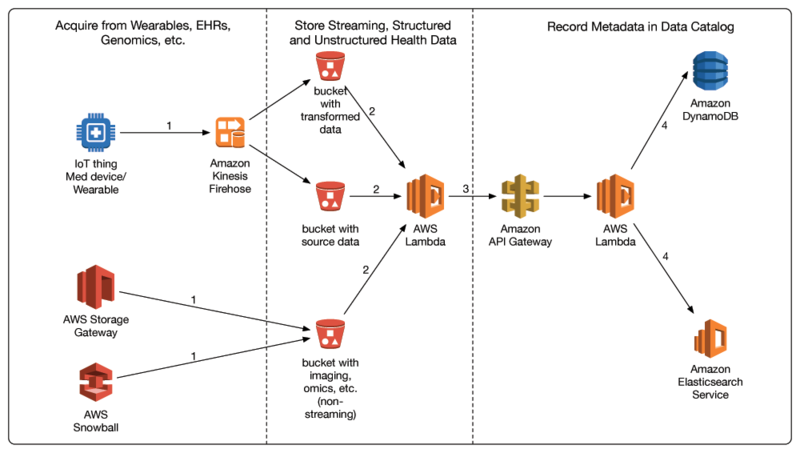 AWS IoT writes to Amazon Kinesis Firehose, which transforms the telemetry data in-flight to land both transformed and raw data in Amazon S3. When data lands in Amazon S3 buckets, an AWS Lambda function is invoked (either by trigger or manually). 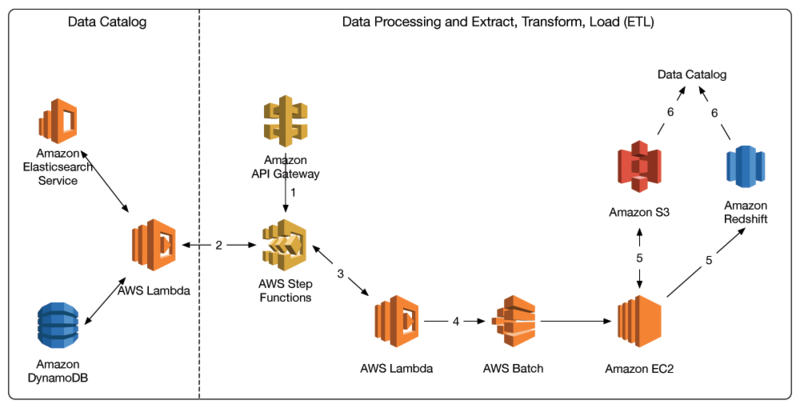 This Lambda function writes to a data catalog that is fronted by Amazon API Gateway. The data catalog contains metadata about all the object data in Amazon S3, as well as data that resides in databases, such as Amazon Redshift. An AWS Lambda function on the other side of API Gateway writes the appropriate metadata about the objects, such as the study that the data was generated from, into Amazon Elasticsearch Service and/or Amazon DynamoDB, which I refer to as the data catalog. The data catalog mentioned in steps 3 and 4 is central to your data management. In most analyses, the first step is to build a data manifest of where the data-of-interest lies, which is discussed in later sections. As I previously mentioned, data can enter your real world evidence data lake in many different formats. In many cases, you might need to normalize this data into a specific format to ease downstream analysis. For example, you might have to integrate many different electronic health records that are stored in different formats. You also might have to transform genomics data, often represented as a variant call format (VCF) file, into a format that’s easier for big data technologies like Apache Parquet to query. While you can certainly analyze this data in the format in which it entered, it might be better for querying after it’s transformed into a different format, or into a different data store. In the architecture shown in the following diagram, AWS Step Functions orchestrates the data normalization (extract, transform, load—or ETL) process. Step Functions is a serverless workflow service that ensures that your long-running ETL jobs execute in order and complete successfully. At a high level, you first query the data catalog to get a manifest of the data to be normalized. Normalization occurs on Amazon EC2 instances, and the results are then stored back in Amazon S3 or in databases such as Amazon Redshift for future analysis. Locations of these results data are also logged in the data catalog for future querying. Either a user or an application submits a POST request through Amazon API Gateway to process or transform a set of data. This request contains the query parameters that correspond to generating the data manifest. It is passed into an AWS Step Functions state machine, which orchestrates the ETL process. A Lambda function queries the data catalog and builds a manifest that contains the location of the data of interest. The manifest is passed to downstream Lambda functions in the state machine that orchestrate the batch workflow to process the data that’s specified in the manifest. These Lambda functions submit jobs to AWS Batch to execute batch jobs on Amazon EC2. Amazon EC2 processes the data (e.g., data normalization) and stores results back in Amazon S3 and/or Amazon Redshift. Results data is then logged in the data catalog, using the process shown in the data acquisition diagram. Ultimately, the value in real world evidence platforms is the value you derive from the wide variety of data that feeds into it. Big data analytics, such as Spark on EMR, machine learning with the Deep Learning AMIs, and healthcare data warehouses, are all fundamental to maximizing the value of RWE. Given the wide array of questions you can answer, you want your architecture to be as flexible as possible. Your organization also might use business intelligence (BI) tools. Again, as with the data normalization tier, you can use Step Functions to orchestrate your workflow. You first build the data manifest and then submit each portion of your desired analysis to the relevant data location and compute options, such as Amazon EMR or Amazon Redshift. Your organization’s BI tool of choice, such as Amazon QuickSight or one offered by our AWS Big Data Competency partners, can extract and visualize the results. A user initiates a query on a dataset. In the context of RWE, this is largely analyzing a cohort in the context of a specific indication (drug response, etc.). AWS Step Functions invokes a Lambda function to query the data catalog and build a manifest of data. The manifest is passed to subsequent Lambda functions, which orchestrate the data analysis through different AWS services. These analyses can include Amazon EMR for population-scale genomics, Amazon EC2 for HPC and machine learning, and Amazon Redshift for your healthcare data warehouse. Results from each analysis are staged back in Amazon S3 and logged in the data catalog. 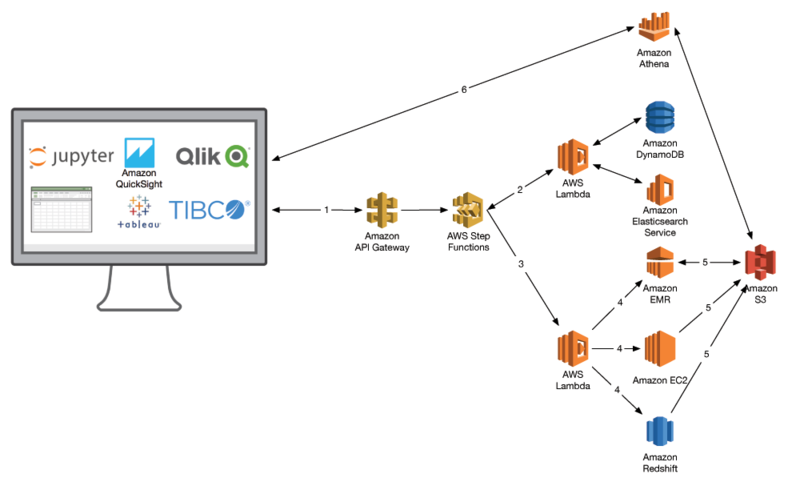 BI tools like Amazon QuickSight or Tableau, or data analysis workbooks like Jupyter can query Amazon S3 to visualize results, such as through Amazon Athena. Imagine that you are at a pharmaceutical company that is developing a drug to address a neurological condition. You have longitudinal data in the form of brain scans and have noticed that the drug compound under development seems to benefit a specific subpopulation of individuals. As a result, you determine to sequence the genomes of all the responders and non-responders to look for specific biomarkers that could indicate response levels. Success would result in a companion diagnostic that you could use alongside your drug to increase its overall efficacy by delivering it only to the responding population. Let’s briefly look at how this study might play out in the steps of data acquisition, normalization, and analysis described earlier. Data from longitudinal brain imaging studies can be moved to AWS using AWS Snowball. Genomics data coming off your genome sequencers would land in Amazon S3 via AWS Storage Gateway and/or AWS Direct Connect. These datasets are stored in your data catalog where you track items such as date generated, anonymized subject ID, etc. Genomes are transformed from raw reads (e.g., FASTQ) to a human readable format (VCF) that identifies variations in a genome. These VCF files are subsequently extracted, transformed, and loaded into a format that is amenable to big data analytics, such as Parquet. You build a data manifest of your brain scans in Amazon S3. You use the deep learning AMI and P2 instance family to build machine learning models to identify images that represent different stages in your disorder-of-interest. You then run association analyses that combine your genomics data with your brain imaging models and drug response data to identify what genomic variants associate with improved treatment outcomes. You can manage these analyses via Jupyter notebooks, or you can connect with your BI tool of choice to visualize your results. By implementing real world evidence platforms on AWS, you can quickly integrate and interrogate disparate healthcare data to advance human health. By designing your RWE platform to be flexible, you can readily incorporate new big data technologies as they become relevant to your needs. This enables you to innovate and discover at a quicker rate. To read more about real world evidence on AWS, and how AWS Partner Network (APN) Premier Consulting Partner Deloitte has architected their ConvergeHEALTH platform on AWS, check out this guest post on the APN Blog! The healthcare ecosystem has chosen a variety of tools and techniques for working with big data, but one tool that comes up again and again in many of the architectures we design and review is Spark on Amazon EMR. Will spark power the data behind precision medicine? Dr. Aaron Friedman is a Healthcare and Life Sciences Partner Solutions Architect at Amazon Web Services. He works with ISVs and SIs to architect healthcare solutions on AWS, and bring the best possible experience to their customers. His passion is working at the intersection of science, big data, and software. In his spare time, he’s exploring the outdoors, learning a new thing to cook, or spending time with his wife and his dog, Macaroon. We launched Amazon AppStream 2.0 at re:Invent 2016. This application streaming service allows you to deliver Windows applications to a desktop browser. 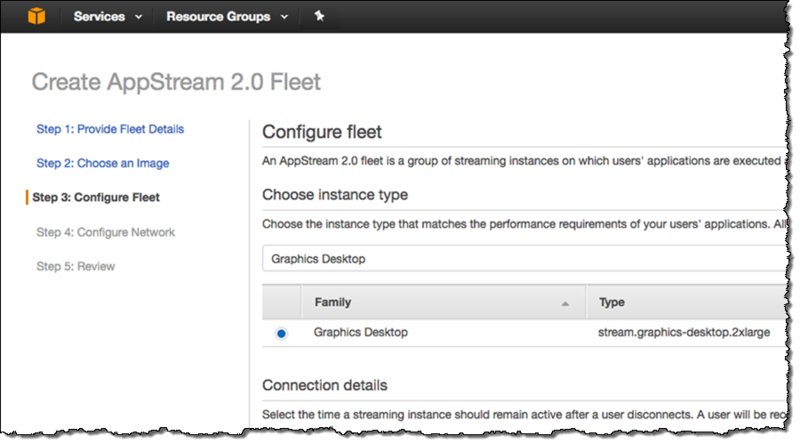 AppStream 2.0 is fully managed and provides consistent, scalable performance by running applications on general purpose, compute optimized, and memory optimized streaming instances, with delivery via NICE DCV – a secure, high-fidelity streaming protocol. Our enterprise and public sector customers have started using AppStream 2.0 in place of legacy application streaming environments that are installed on-premises. They use AppStream 2.0 to deliver both commercial and line of business applications to a desktop browser. Our ISV customers are using AppStream 2.0 to move their applications to the cloud as-is, with no changes to their code. These customers focus on demos, workshops, and commercial SaaS subscriptions. 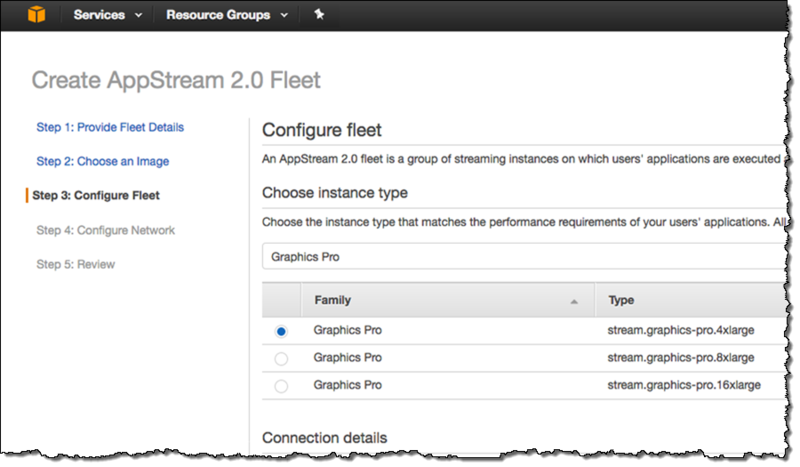 We are getting great feedback on AppStream 2.0 and have been adding new features very quickly (even by AWS standards). So far this year we have added an image builder, federated access via SAML 2.0, CloudWatch monitoring, Fleet Auto Scaling, Simple Network Setup, persistent storage for user files (backed by Amazon S3), support for VPC security groups, and built-in user management including web portals for users. To learn more about how to launch, run, and scale a streaming application environment, read Scaling Your Desktop Application Streams with Amazon AppStream 2.0. As I noted earlier, you can use either of these two instance types to build an AppStream image. This will allow you to test and fine tune your applications and to see the instances in action. 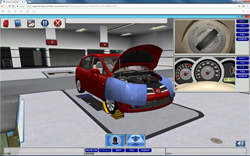 Nissan, a Japanese multinational automobile manufacturer, trains its automotive specialists using 3D simulation software running on expensive graphics workstations. The training software, developed by The DiSti Corporation, allows its specialists to simulate maintenance processes by interacting with realistic 3D models of the vehicles they work on. 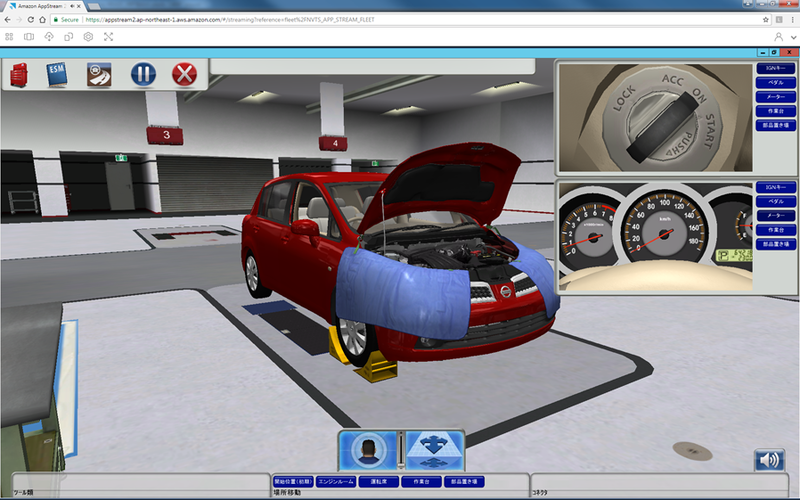 AppStream 2.0’s new graphics capability now allows Nissan to deliver these training tools in real time, with up to date content, to a desktop browser running on low-cost commodity PCs. Their specialists can now interact with highly realistic renderings of a vehicle that allows them to train for and plan maintenance operations with higher efficiency. Both of the graphics streaming instance families are available in the US East (Northern Virginia), US West (Oregon), EU (Ireland), and Asia Pacific (Tokyo) Regions and you can start streaming from them today. Your applications must run in a Windows 2012 R2 environment, and can make use of DirectX, OpenGL, CUDA, OpenCL, and Vulkan. 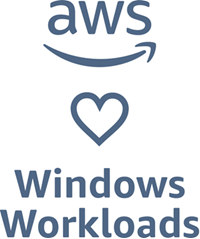 With prices in the US East (Northern Virginia) Region starting at $0.50 per hour for Graphics Desktop instances and $2.05 per hour for Graphics Pro instances, you can now run your simulation, visualization, and HPC workloads in the AWS Cloud on an economical, pay-by-the-hour basis. You can also take advantage of fast, low-latency access to Amazon Elastic Compute Cloud (EC2), Amazon Simple Storage Service (S3), AWS Lambda, Amazon Redshift, and other AWS services to build processing workflows that handle pre- and post-processing of your data. Most organizations create multiple AWS accounts because they provide the highest level of resource and security isolation. In this blog post, I will discuss how to use cross account AWS Identity and Access Management (IAM) access to orchestrate continuous integration and continuous deployment. Do I need multiple accounts? Does your business require administrative isolation between workloads? Administrative isolation by account is the most straightforward way to grant independent administrative groups different levels of administrative control over AWS resources based on workload, development lifecycle, business unit (BU), or data sensitivity. Does your business require limited visibility and discoverability of workloads? Accounts provide a natural boundary for visibility and discoverability. Workloads cannot be accessed or viewed unless an administrator of the account enables access to users managed in another account. Does your business require isolation to minimize blast radius? Separate accounts help define boundaries and provide natural blast-radius isolation to limit the impact of a critical event such as a security breach, an unavailable AWS Region or Availability Zone, account suspensions, and so on. Does your business require a particular workload to operate within AWS service limits without impacting the limits of another workload? You can use AWS account service limits to impose restrictions on a business unit, development team, or project. For example, if you create an AWS account for a project group, you can limit the number of Amazon Elastic Compute Cloud (Amazon EC2) or high performance computing (HPC) instances that can be launched by the account. Does your business require strong isolation of recovery or auditing data? If regulatory requirements require you to control access and visibility to auditing data, you can isolate the data in an account separate from the one where you run your workloads (for example, by writing AWS CloudTrail logs to a different account). Do your workloads depend on specific instance reservations to support high availability (HA) or disaster recovery (DR) capacity requirements? Reserved Instances (RIs) ensure reserved capacity for services such as Amazon EC2 and Amazon Relational Database Service (Amazon RDS) at the individual account level. Developers check the code into an AWS CodeCommit repository. It stores all the repositories as a single source of truth for application code. Developers have full control over this account. This account is usually used as a sandbox for developers. A central location for all the tools related to the organization, including continuous delivery/deployment services such as AWS CodePipeline and AWS CodeBuild. Developers have limited/read-only access in this account. The Operations team has more control. Applications using the CI/CD orchestration for test purposes are deployed from this account. Developers and the Operations team have limited/read-only access in this account. Applications using the CI/CD orchestration tested in the ToolsAccount are deployed to production from this account. Developers and the Operations team have limited/read-only access in this account. In this solution, we will check in sample code for an AWS Lambda function in the Dev account. This will trigger the pipeline (created in AWS CodePipeline) and run the build using AWS CodeBuild in the Tools account. The pipeline will then deploy the Lambda function to the Test and Prod accounts. Clone this repository. It contains the AWS CloudFormation templates that we will use in this walkthrough. Follow the instructions in the repository README to push the sample AWS Lambda application to an AWS CodeCommit repository in the Dev account. Install the AWS Command Line Interface as described here. To prepare your access keys or assume-role to make calls to AWS, configure the AWS CLI as described here. Note: Follow the steps in the order they’re written. Otherwise, the resources might not be created correctly. In the Tools account, deploy this CloudFormation template. It will create the customer master keys (CMK) in AWS Key Management Service (AWS KMS), grant access to Dev, Test, and Prod accounts to use these keys, and create an Amazon S3 bucket to hold artifacts from AWS CodePipeline. In the output section of the CloudFormation console, make a note of the Amazon Resource Number (ARN) of the CMK and the S3 bucket name. You will need them in the next step. In the Dev account, which hosts the AWS CodeCommit repository, deploy this CloudFormation template. This template will create the IAM roles, which will later be assumed by the pipeline running in the Tools account. Enter the AWS account number for the Tools account and the CMK ARN. In the Test and Prod accounts where you will deploy the Lambda code, execute this CloudFormation template. This template creates IAM roles, which will later be assumed by the pipeline to create, deploy, and update the sample AWS Lambda function through CloudFormation. In the Tools account, which hosts AWS CodePipeline, execute this CloudFormation template. This creates a pipeline, but does not add permissions for the cross accounts (Dev, Test, and Prod). In the Tools account, execute this CloudFormation template, which give access to the role created in step 4. This role will be assumed by AWS CodeBuild to decrypt artifacts in the S3 bucket. This is the same template that was used in step 1, but with different parameters. Add the IAM role created in step 2. This role is used by AWS CodePipeline in the Tools account for checking out code from the AWS CodeCommit repository in the Dev account. Add the IAM role created in step 3. This role is used by AWS CodePipeline in the Tools account for deploying the code package to the Test and Prod accounts. The pipeline created in step 4 and updated in step 6 checks out code from the AWS CodeCommit repository. It uses the IAM role created in step 2. The IAM role created in step 4 has permissions to assume the role created in step 2. This role will be assumed by AWS CodeBuild to decrypt artifacts in the S3 bucket, as described in step 5. The IAM role created in step 2 has permission to check out code. See here. The IAM role created in step 2 also has permission to upload the checked-out code to the S3 bucket created in step 1. It uses the KMS keys created in step 1 for server-side encryption. Upon successfully checking out the code, AWS CodePipeline triggers AWS CodeBuild. The AWS CodeBuild project created in step 4 is configured to use the CMK created in step 1 for cryptography operations. See here. The AWS CodeBuild role is created later in step 4. In step 5, access is granted to the AWS CodeBuild role to allow the use of the CMK for cryptography. AWS CodeBuild uses pip to install any libraries for the sample Lambda function. It also executes the aws cloudformation package command to create a Lambda function deployment package, uploads the package to the specified S3 bucket, and adds a reference to the uploaded package to the CloudFormation template. See here. Using the role created in step 3, AWS CodePipeline executes the transformed CloudFormation template (received as an output from AWS CodeBuild) in the Test account. The AWS CodePipeline role created in step 4 has permissions to assume the IAM role created in step 3, as described in step 5. The IAM role assumed by AWS CodePipeline passes the role to an IAM role that can be assumed by CloudFormation. 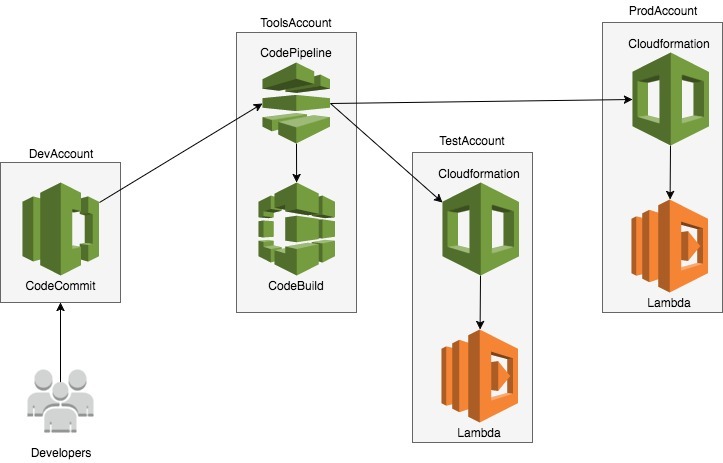 AWS CloudFormation creates and updates the Lambda function using the code that was built and uploaded by AWS CodeBuild. Creating multiple AWS accounts provides the highest degree of isolation and is appropriate for a number of use cases. However, keeping a centralized account to orchestrate continuous delivery and deployment using AWS CodePipeline and AWS CodeBuild eliminates the need to duplicate the delivery pipeline. 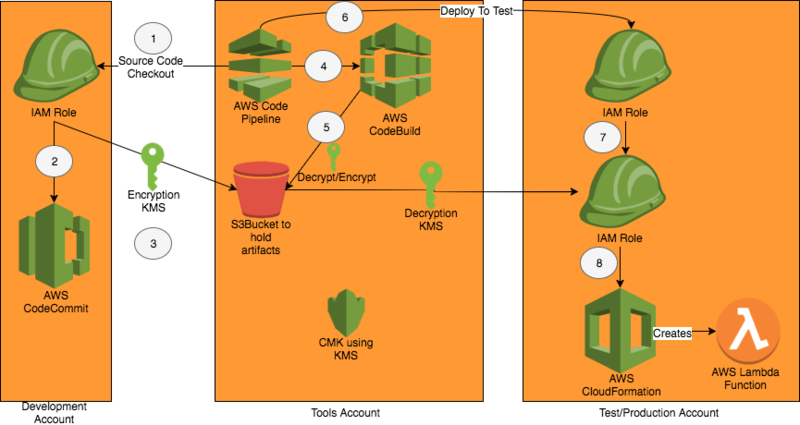 You can secure the pipeline through the use of cross account IAM roles and the encryption of artifacts using AWS KMS. For more information, see Providing Access to an IAM User in Another AWS Account That You Own in the IAM User Guide. Customers running high performance computing (HPC) workloads on Amazon Linux occasionally ask to disable the Intel Hyper-Threading Technology (HT Technology) that is enabled by default. In the pre-cloud world, this was usually performed by modifying the BIOS. That turned off HT Technology for all users, regardless of any possible benefits obtainable, for example, on I/O intensive workloads. With the cloud, HT Technology can be turned on or off, as is best for a particular application. This post discusses methods for disabling HT Technology. Hyper-Threading Technology makes a single physical processor appear as multiple logical processors. To do this, there is one copy of the architecture state for each logical processor, and the logical processors share a single set of physical execution resources. For more information, see Hyper-Threading Technology Architecture and Microarchitecture. This is best explained with an analogy. Imagine that you own a small business assembling crafts for sale on Amazon Handmade. You have a building where the crafts are assembled. Six identical workbenches are inside. Each workbench includes a hammer, a wrench, a screwdriver, a paintbrush, etc. The craftspeople work independently, to produce approximately six times the output as a single craftsperson. On rare occasions, they contend for resources (for example, waiting in a short line to pull some raw materials off the shelf). As it turns out, business is booming and it’s time to expand production, but there is no more space to add workbenches. The decision is made to have two people work at each workbench. Overall, this is effective, because often there is still little contention between the workers—when one is using the hammer, the other doesn’t need it and is using the wrench. Occasionally one of the workers has to wait because the other worker is using the hammer. Contention for resources is somewhat higher in the single workbench case versus workbench-to-workbench. HT Technology works in a way analogous to that small business. The building is like the processor, the workbenches like cores, and the workers like threads. Within the Intel Xeon processor, there are two threads of execution in each core. The core is designed to allow progress to be made on one thread (execution state) while the other thread is waiting for a relatively slow operation to occur. In this context, even cached memory is slow, much less main memory (many dozens or hundreds of clock cycles away). Operations involving things like disk I/O are orders of magnitude worse. However, in cases where both threads are operating primarily on very close (e.g., registers) or relatively close (first-level cache) instructions or data, the overall throughput occasionally decreases compared to non-interleaved, serial execution of the two lines of execution. A good example of contention that makes HT Technology slower is an HPC job that relies heavily on floating point calculations. In this case, the two threads in each core share a single floating point unit (FPU) and are often blocked by one another. In the case of LINPACK, the benchmark used to measure supercomputers on the TOP500 list, many studies have shown that you get better performance by disabling HT Technology. But FPUs are not the only example. Other, very specific workloads can be shown by experimentation to be slower in some cases when HT Technology is used. Speaking of experimentation… before I discuss how to disable HT Technology, I’d like to discuss whether to disable it. Disabling HT Technology may help some workloads, but it is much more likely that it hinders others. In a traditional HPC environment, you have to decide to enable or disable HT Technology because you only have one cluster. In the cloud, you are not limited to one cluster. You can run multiple clusters and disable HT Technology in some cases while leaving it enabled in others. In addition, you can easily test both configurations and decide which is best based on empirical evidence. With that said, for the overwhelming majority of workloads, you should leave HT Technology enabled. Look at the configuration on an Amazon Linux instance. I ran the examples below on an m4.2xlarge, which has eight vCPUs. Note that each vCPU is a thread of an Intel Xeon core. Therefore, the m4.2xlarge has four cores, each of which run two threads, resulting in eight vCPUs. You can see this by running lscpu (note that I have removed some of the output for brevity). You can see from the output that there are four cores, and each core has two threads, resulting in eight CPUs. Exactly as expected. Furthermore, you can run lscpu –extended to see the details of the individual CPUs. Notice that the eight CPUs are numbered 0–7. You can see that the first set of four CPUs are each associated with a different core, and the cores are repeated for the second set of four CPUs. Therefore, CPU 0 and CPU 4 are the two threads in core 0, CPU 1 and CPU 5 are the two threads in core 1 and so on. The Linux kernel, while generally agnostic on the topic and happy to schedule any thread on any logical CPU, is smart enough to know the difference between cores and threads. It gives preference to scheduling the first operating system threads per core. Only when all cores are busy does the kernel add OS threads to cores using the second hardware thread. Now that you understand the relationship between CPUs and cores, you can disable the second set of CPUs using a process called "hotplugging” (in this case, you might say "hot-unplugging”). For more information, see CPU hotplug in the Kernel. Each logical CPU is represented in the Linux “filesystem” at an entirely virtual location under /sys/devices/system/cpu/. This isn’t really part of the literal filesystem, of course. Linux designers unified the actual filesystem, as well as devices and kernel objects, into a single namespace with many common operations, including the handy ability to control the state of kernel objects by changing the contents of the “files” that represent them. Here you see directory entries for each CPU, and under each directory you find an "online" file used to enable/disable the CPU. Now you can simply write a 0 to that file to disable the CPU. The kernel is smart enough to allow any scheduled operations to continue to completion on that CPU. The kernel then saves its state at the next scheduling event, and resumes those operations on another CPU when appropriate. Note the nice safety feature that Linux provides: you cannot disable CPU 0 and get an access-denied error if you try. Imagine what would happen if you accidentally took all the CPUs offline! Disable CPU4 (the second thread in the first core in the m4.2xlarge). You must be the root user to do this. Now you can run lscpu –extended again and see that CPU 4 is offline. You can repeat this process for CPUs 5–7 to disable them all. However, this would be tedious on an x1.32xlarge with 128 vCPUs. You can use a script to disable them all. Let me explain what that script does. First, it finds the total number of CPUs. Then, it loops over the second half of the CPUs. Finally, it disables each CPU in turn. After running the script, you can run lscpu –extended and see that second half of your CPUs are disabled, leaving only one thread per core. Perfect! At this point, you have a script to disable HT Technology, but the change is only persisted until the next reboot. To apply the script on every boot, you can add the script to rc.local or use cloud-init bootcmd. When you launch an instance, add this for User data in step 3 of the wizard. The instance starts with HT Technology disabled and disables it on subsequent reboots. An alternative approach is to edit grub.conf. Open /boot/grub/grub.conf in your favorite editor. Find the kernel directive and a maxcpus=X parameter where X is half the total number CPUs. Remember that Linux enumerates the first thread in each core followed by the second thread in each core. Therefore, limiting the number of CPUs to half of the total disables the second thread in each core just like you did with hotplugging earlier. You must reboot for this change to take effect. Customers running HPC workloads on Amazon Linux cannot access the BIOS to disable HT Technology. This post described a process to disable the second thread in each core at runtime and during boot. In a future post, we examine similar solutions for configuring CPUs in Windows. Last year I announced that AWS had signed an agreement to acquire NICE, and that we planned to work together to create even better tools and services for high performance and scientific computing. 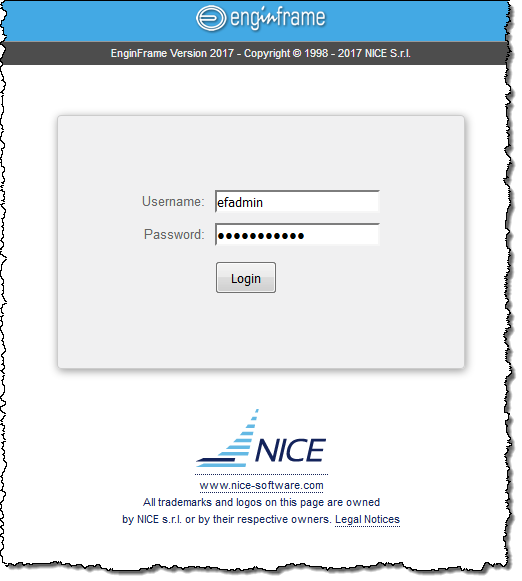 Today I am happy to be able to tell you about the launch of NICE EnginFrame 2017. This product is designed to simplify the process of setting up and running technical and scientific applications that take advantage of the power, scale, and flexibility of the AWS Cloud. You can set up a fully functional HPC cluster in less than an hour and then access it through a simple web-based user interface. If you are already familiar with and using EnginFrame, you can keep running it on-premises or make the move to the cloud. Your clusters (you can launch more than one if you’d like) reside within a Virtual Private Cloud (VPC) and are built using multiple AWS services and features including Amazon Elastic Compute Cloud (EC2) instances running the Amazon Linux AMI, Amazon Elastic File System for shared, NFS-style file storage, AWS Directory Service for user authentication, and Application Load Balancers for traffic management. These managed services allow you to focus on your workloads and your work. You don’t have to worry about system software upgrades, patches, scaling of processing or storage, or any of the other responsibilities that you’d have if you built and ran your own clusters. Main Stack – This stack hosts the shared, EFS-based storage for your cluster and an Application Load Balancer that routes incoming requests to the Default Cluster Stack. The stack is also host to a set of AWS Lambda functions that take care of setting up and managing IAM Roles and SSL certificates. Default Cluster Stack – This stack is managed by the Main Stack and is where the heavy lifting takes place. The cluster is powered by CfnCluster and scales up and down as needed, terminating compute nodes when they are no longer needed. It also runs the EnginFrame portal. After you launch your cluster, you will interact with it using the web-based EnginFrame portal. The portal will give you access to your applications (both batch and interactive), your data, and your jobs. You (or your cluster administrator) can create templates for batch applications and associate actions for specific file types. 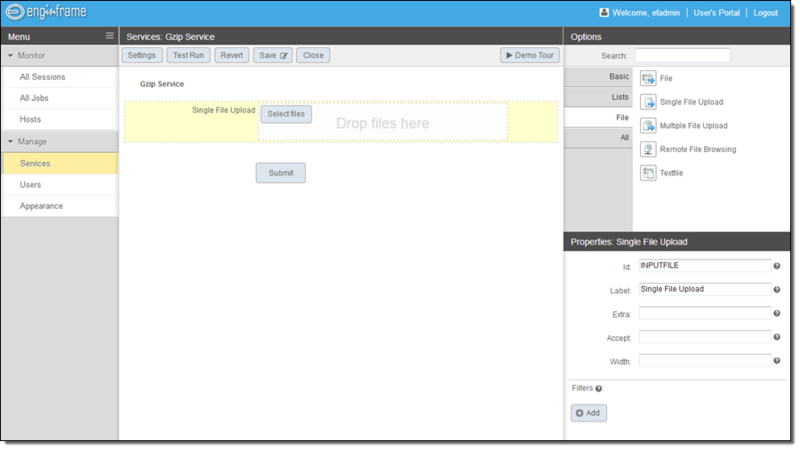 EnginFrame includes an interactive file manager and a spooler view that lets you track the output from your jobs. In this release, NICE added a new file uploader that allows you to upload several files at the same time. The file uploader can also reduce upload time by caching commonly used files. This just scratches the surface of what EnginFrame can do, but it is all that I have time for today. EnginFrame 2017 is available now and you can start using it today. You pay for the AWS resources that you use (EC2 instances, EFS storage, and so forth) and can use EnginFrame at no charge during the initial 90 day evaluation period. After that, EnginFrame is available under a license that is based on the number of concurrent users. In November all the AWS Community Heroes were invited to reInvent and got a chance to join us for a private event for Heroes on Monday evening. The final two Heroes of the 2016 cohort were surprised with an invitation on Monday morning of reInvent week to join the Hero community. They were both able to join us at the event on short notice and were able to meet the other Heroes. Ayumi Tada works at Honda Motor Co. in Japan as an IT infrastructure strategist, promoting the utilization of cloud computing technologies. She also promotes cloud utilization in the CAE/HPC area at JAMA (Japan Automobile Manufacturers Association). Previously, she worked at Honda R&D as an IT System Administrator, focused on using cloud for High Performance Computing (HPC), including an engineering simulation system (Computer Aided Engineering / CAE), and introduced the use case of HPC on AWS at re:Invent 2014. Currently, she is promoting cloud utilization in a wide range of Enterprise applications. Ayumi is a member of JAWS-UG (Japan AWS User Group). JAWS-UG was started in 2010, and has over 50+ branches, 100+ leaders, 300+ meetup events per year, and 4000+ members. She is a one of the launch leads of new JAWS branches for HPC specialists and for beginners. She is also a one of the organizers of the JAWS for women branch and participates in other local branches including Kumamoto & JAWS for Enterprises (E-JAWS) meetup events. 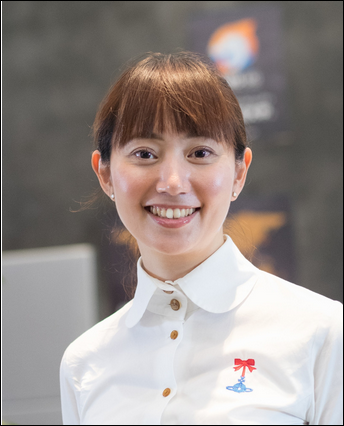 Ayumi has an AWS Certified Solutions Architect – Associate certification, she is a Career Development Adviser through the National Career Development Centers’ international partner organization, and she has a BS in Electrical & Electronic Engineering and Information Engineering from Waseda University. Shimon Tolts has been fascinated by computers since he was eight. When he got his first PC, he immediately started tearing it apart to understand how the different parts were connected to each other. Later, Linux and open source software also had a strong influence, and Shimon started his first company at the age of 15, providing web hosting on top of Linux servers in the pre-cloud era. During his military service, Shimon served as a Computer Crimes Investigator & Forensics Analyst at the Center Unit for Special Investigations, helping him succeed in a role at Intel Security following his service. In 2013 Shimon joined ironSource, to establish the R&D infrastructure division. One of the most innovative solutions developed was a Big Data pipeline that was used to stream hundreds of billions of monthly events from different ironSource divisions into Redshift in near real-time. After receiving requests for his solution by the tech community, this solution was released publicly as ATOM DATA. 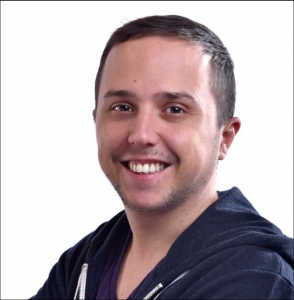 Shimon leads the Israeli AWS user group and is a regular speaker at Big Data conferences, from AWS Summits to Pop-up Lofts. This is a guest post from Linda Hedges, Principal SA, High Performance Computing. One question we often hear is: “How well will my application scale on AWS?” For HPC workloads that cross multiple nodes, the cluster network is at the heart of scalability concerns. AWS uses advanced Ethernet networking technology which, like all things AWS, is designed for scale, security, high availability, and low cost. This network is exceptional and continues to benefit from Amazon’s rapid pace of development. For real world applications, all but the most demanding customers find that their applications run very well on AWS! Many have speculated that highly-coupled workloads require a name-brand network fabric to achieve good performance. For most applications, this is simply not the case. As with all clusters, the devil is in the details and some applications benefit from cluster tuning. This blog discusses the scalability of a representative, real-world application and provides a few performance tips for achieving excellent application performance using STARCCM+ as an example. For more HPC specific information, please see our website. TLG Aerospace, a Seattle based aerospace engineering services company, runs most of their STARCCM+ Computational Fluid Dynamics (CFD) cases on AWS. A detailed case study describing TLG Aerospace’s experience and the results they achieved can be found here. This blog uses one of their CFD cases as an example to understand AWS scalability. By leveraging Amazon EC2 Spot instances which allow customers to purchase unused capacity at significantly reduced rates, TLG Aerospace consistently achieves an 80% cost savings compared to their previous cloud and on-premise HPC cluster options. TLG Aerospace experiences solid value, terrific scale-up, and effectively limitless case throughput – all with no queue wait! 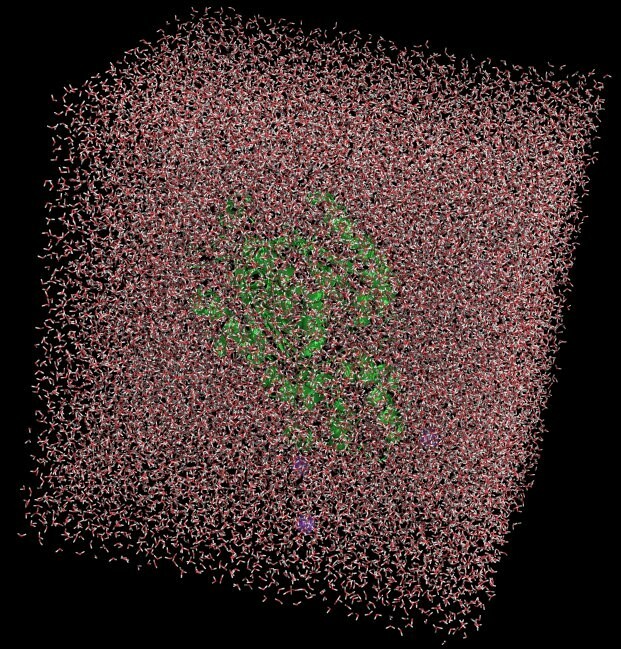 HPC applications such as Computational Fluid Dynamics (CFD) depend heavily on the application’s ability to efficiently scale compute tasks in parallel across multiple compute resources. Parallel performance is often evaluated by determining an application’s scale-up. Scale-up is a function of the number of processors used and is defined as the time it takes to complete a run on one processor, divided by the time it takes to complete the same run on the number of processors used for the parallel run. As an example, consider an application with a time to completion, or turn-around time of 32 hours when run on one processor. If the same application runs in one hour when run on 32 processors, then the scale-up is 32 hours of time on one processor / 1 hour time on 32 processors, or equal to 32, for 32 processes. Scaling is considered to be excellent when the scale-up is close to or equal to the number of processors on which the application is run. If the same application took eight hours to complete on 32 processors, it would have a scale-up of only four: 32 (time on one processor) / 8 (time to complete on 32 processors). A scale-up of four on 32 processors is considered to be poor. In addition to characterizing the scale-up of an application, scalability can be further characterized as “strong” or “weak” scaling. Note that the term “weak”, as used here, does not mean inadequate or bad but is a technical term facilitating the description of the type of scaling which is sought. Strong scaling offers a traditional view of application scaling, where a problem size is fixed and spread over an increasing number of processors. As more processors are added to the calculation, good strong scaling means that the time to complete the calculation decreases proportionally with increasing processor count. In comparison, weak scaling does not fix the problem size used in the evaluation, but purposely increases the problem size as the number of processors also increases. The ratio of the problem size to the number of processors on which the case is run is held constant. For a CFD calculation, problem size most often refers to the size of the grid for a similar configuration. An application demonstrates good weak scaling when the time to complete the calculation remains constant as the ratio of compute effort to the number of processors is held constant. Weak scaling offers insight into how an application behaves with varying case size. Scale-up as a function of increasing processor count is shown in Figure 1 for the STARCCM+ case data provided by TLG Aerospace. This is a demonstration of “strong” scalability. The blue line shows what ideal or perfect scalability looks like. The purple triangles show the actual scale-up for the case as a function of increasing processor count. Excellent scaling is seen to well over 400 processors for this modest-sized 16M cell case as evidenced by the closeness of these two curves. This example was run on Amazon EC2 c3.8xlarge instances, each an Intel E5-2680, providing either 16 cores or 32 hyper-threaded processors. AWS customers can choose to run their applications on either threads or cores. AWS provides access to the underlying hardware of our servers. For an application like STARCCM+, excellent linear scaling can be seen when using either threads or cores though testing of a specific case and application is always recommended. For this example, threads were chosen as the processing basis. Running on threads offered a few percent performance improvement when compared to running the same case on cores. Note that the number of available cores is equal to half of the number of available threads. The scalability of real-world problems is directly related to the ratio of the compute-effort per-core to the time required to exchange data across the network. The grid size of a CFD case provides a strong indication of how much computational effort is required for a solution. Thus, larger cases will scale to even greater processor counts than for the modest size case discussed here. STARCCM+ has been shown to demonstrate exceptional “weak” scaling on AWS. That’s not shown here though weak scaling is reflected in Figure 2 by plotting the cells per processor on the horizontal axis. 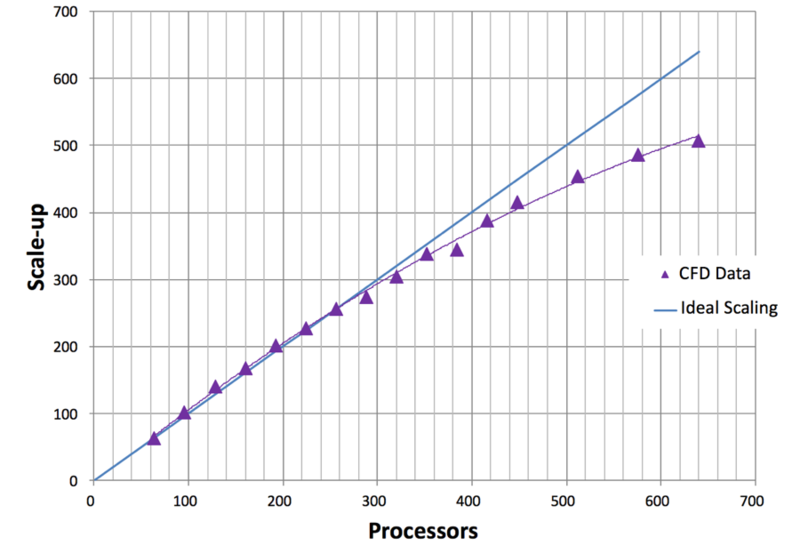 The purple line in Figure 2 shows scale-up as a function of grid cells per processor. The vertical axis for scale-up is on the left-hand side of the graph as indicated by the purple arrow. 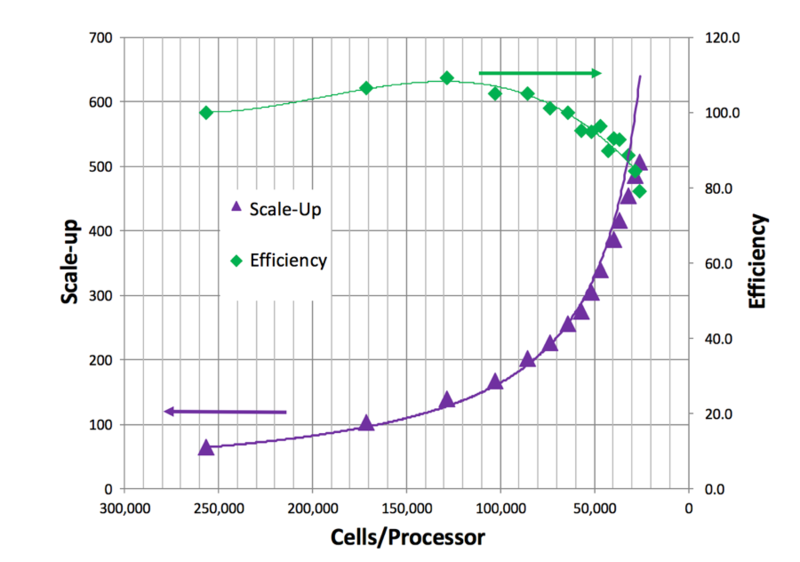 The green line in Figure 2 shows efficiency as a function of grid cells per processor. The vertical axis for efficiency is shown on the right hand side of the graph and is indicated with a green arrow. Efficiency is defined as the scale-up divided by the number of processors used in the calculation. Weak scaling is evidenced by considering the number of grid cells per processor as a measure of compute effort. Holding the grid cells per processor constant while increasing total case size demonstrates weak scaling. Weak scaling is not shown here because only one CFD case is used. Fewer grid cells per processor means reduced computational effort per processor. Maintaining efficiency while reducing cells per processor demonstrates the excellent strong scalability of STARCCM+ on AWS. Efficiency remains at about 100% between approximately 250,000 grid cells per thread (or processor) and 100,000 grid cells per thread. Efficiency starts to fall off at about 100,000 grid cells per thread. An efficiency of at least 80% is maintained until 25,000 grid cells per thread. Decreasing grid cells per processor leads to decreased efficiency because the total computational effort per processor is reduced. Note that the perceived ability to achieve more than 100% efficiency (here, at about 150,000 cells per thread) is common in scaling studies, is case specific, and often related to smaller effects such as timing variation and memory caching. Plots of scale-up and efficiency offer understanding of how a case or application scales. The bottom line though is that what really matters to most HPC users is case turn-around time and cost. 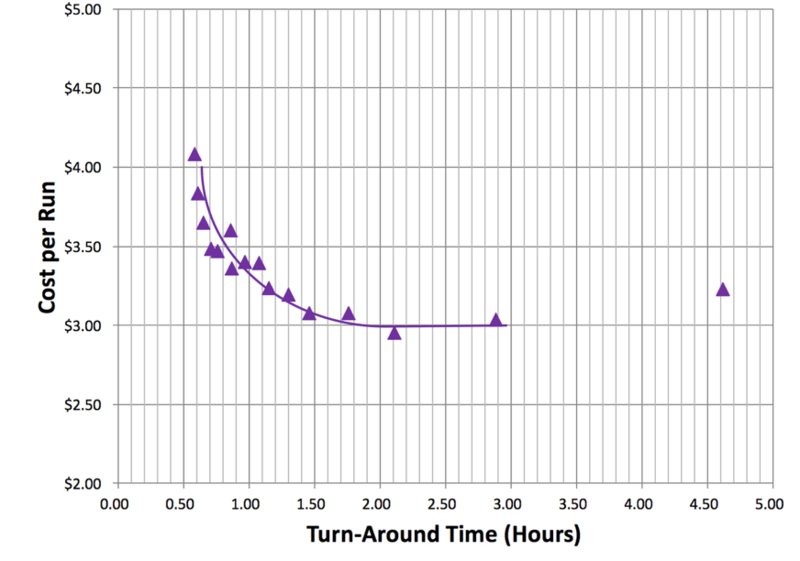 A plot of turn-around time versus CPU cost for this case is shown in Figure 3. As the number of threads are increased, the total turn-around time decreases. But also, as the number of threads increase, the inefficiency increases. Increasing inefficiency leads to increased cost. The cost shown is based on typical Amazon Spot price for the c3.8xlarge and only includes the computational costs. Small costs will also be incurred for data storage. Minimum cost and turn-around time were achieved with approximately 100,000 cells per thread. Many users will choose a cell count per thread to achieve the lowest possible cost. Others, may choose a cell count per thread to achieve the fastest turn-around time. If a run is desired in 1/3rd the time of the lowest price point, it can be achieved with approximately 25,000 cells per thread. (Note that many users run STARCCM+ with significantly fewer cells per thread than this.) While this increases the compute cost, other concerns, such as license costs or schedules can be over-riding factors. For this 16M cell case, the added inefficiency results in an increase in run price from $3 to $4 for computing. Many find the reduced turn-around time well worth the price of the additional instances. As with any cluster, good performance requires attention to the details of the cluster set up. While AWS allows for the quick set up and take down of clusters, performance is affected by many of the specifics in that set up. This blog provides some examples. On AWS, a placement group is a grouping of instances within a single Availability Zone that allow for low latency between the instances. Placement groups are recommended for all applications where low latency is a requirement. A placement group was used to achieve the best performance from STARCCM+. More on placement groups can be found in our docs. Amazon Linux is a version of Linux maintained by Amazon. The distribution evolved from Red Hat Linux (RHEL) and is designed to provide a stable, secure, and highly performant environment. Amazon Linux is optimized to run on AWS and offers excellent performance for running HPC applications. For the case presented here, the operating system used was Amazon Linux. Other Linux distributions are also performant. However, it is strongly recommended that for Linux HPC applications, a minimum of the version 3.10 Linux kernel be used to be sure of using the latest Xen libraries. See our Amazon Linux page to learn more. Amazon Elastic Block Store (EBS) is a persistent block level storage device often used for cluster storage on AWS. EBS provides reliable block level storage volumes that can be attached (and removed) from an Amazon EC2 instance. A standard EBS general purpose SSD (gp2) volume is all that is required to meet the needs of STARCCM+ and was used here. Other HPC applications may require faster I/O to prevent data writes from being a bottle neck to turn-around speed. For these applications, other storage options exist. A guide to amazon storage is found here. As mentioned previously, STARCCM+, like many other CFD solvers, runs well on both threads and cores. Hyper-Threading can improve the performance of some MPI applications depending on the application, the case, and the size of the workload allocated to each thread; it may also slow performance. 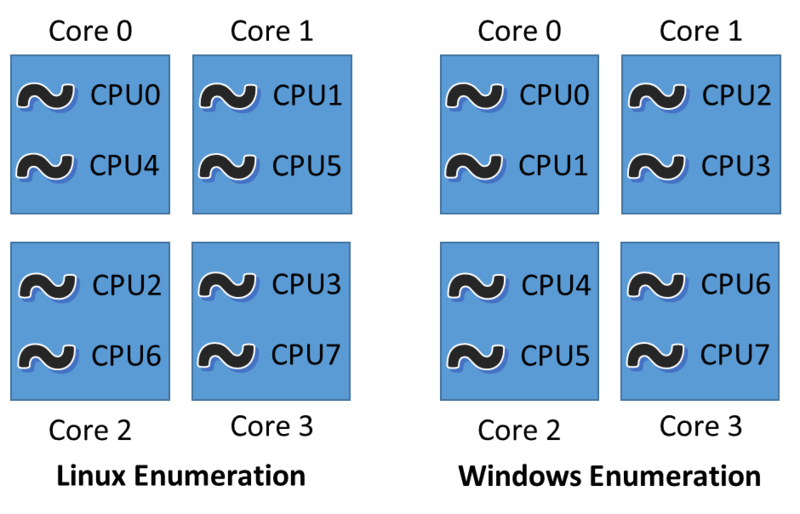 The one-size-fits-all nature of the static cluster compute environments means that most HPC clusters disable hyper-threading. To first order, it is believed that computationally intensive workloads run best on cores while those that are I/O bound may run best on threads. Again, a few percent increase in performance was discovered for this case, by running with threads. If there is no time to evaluate the effect of hyper-threading on case performance than it is recommended that hyper-threading be disabled. When hyper-threading is disabled, it is important to bind the core to designated CPU. This is called processor or CPU affinity. It almost universally improves performance over unpinned cores for computationally intensive workloads. Occasionally, an application will include frequent time measurement in their code; perhaps this is done for performance tuning. Under these circumstances, performance can be improved by setting the clock source to the TSC (Time Stamp Counter). This tuning was not required for this application but is mentioned here for completeness. When evaluating an application, it is always recommended that a meaningful real-world case be used. A case that is too big or too small won’t reflect the performance and scalability achievable in every day operation. The only way to know positively how an application will perform on AWS is to try it! AWS offers solid strong scaling and exceptional weak scaling. Good performance can be achieved on AWS, for most applications. In addition to low cost and quick turn-around time, important considerations for HPC also include throughput and availability. AWS offers effectively limitless throughput, security, cost-savings, and high-availability making queues a “thing of the past”. A long queue wait makes for a very long case turn-around time, regardless of the scale. Twenty four (24) external and internal contributors worked together to create this edition of the AWS Week in Review. If you would like to join the party please visit the AWS Week in Review on GitHub. I am also about to open up some discussion on a simplified and streamlined submission process. We announced the X1.16xlarge and X1 Availability in More Regions. We published AWS Quick Starts for Atlassian JIRA Software and Bitbucket Data Center. The AWS Podcast released an episode discussing the AWS Week In Review contribution process. The AWS Compute Blog talked about Powering Mobile Backend Services with AWS Lambda and Amazon API Gateway. The AWS Database Blog showed you how to Scale Your Amazon RDS Instance Vertically and Horizontally. 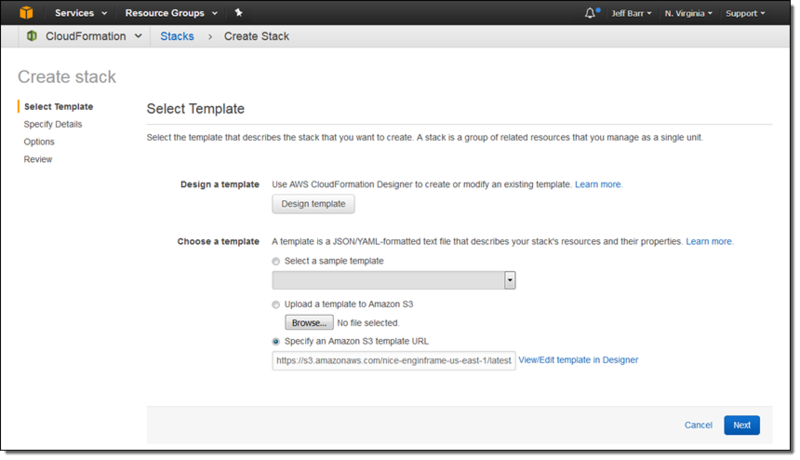 The AWS Mobile Development Blog showed you Store Your App Photos in the Cloud Using Amazon S3. 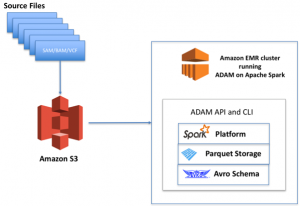 The AWS Big Data Blog talked about Optimizing Amazon S3 for High Concurrency in Distributed Workloads. Boxfuse wrote about Introducing AWS CloudWatch Logs support with Live Tailing. CloudCheckr wrote about 3 Things for MSPs to Consider About Google’s Orbitera Acquisition. The Stelligent Blog wrote about Provisioning a hosted Git repo with AWS CodeCommit using CloudFormation. The AWS Government, Education, & Nonprofits Blog wrote about What do 5 Myths, Cloud Ninjas, and the Golden State have in Common? Find out at IACP!. The AWS Government, Education, & Nonprofits Blog wrote about Compliance without Compromise: Watch the Introduction to AWS GovCloud (US) Video. The folks at Cloudability compiled all of their AWS re:Invent 2016 content into an informative hub. Take a look to learn how to make the most out of re:Invent 2016. The A Cloud Guru blog wrote about DynamoDB in the post ‘To SQL or NoSQL’. 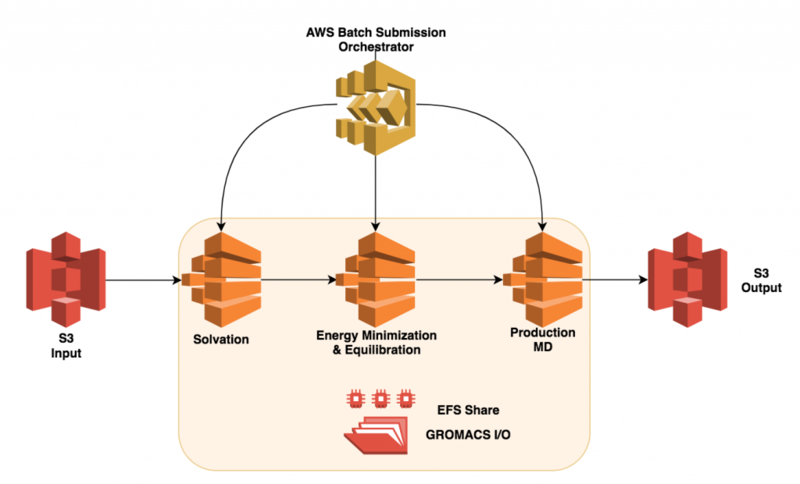 The AWS Compute Blog talked about Orchestrating GPU-Accelerated Workloads on Amazon ECS. The AWS Enterprise Blog listed 4 Foundational Investments for Your Cloud Journey. CloudRanger shared a Case Study: VOKKE streamline and simplify their EBS snapshot management with CloudRanger. FittedCloud Announced New Dynamic Resource Optimization solutions for AWS based on Machine Learning. The Cloud Academy Blog wrote a post about ServerlessConf Tokyo: Highlights from Japan on how app-development is changing. Scott Johnson continued his tutorial on SSH troubles using Ansible as a diagnostic tool. Cloudability shared AWS re:Invent 2016 Sessions Not to Miss: Big Brand Stories, Winning with AWS. We announced an Amazon ElastiCache for Redis Update with Sharded Clusters, Engine Improvements, and More. We announced AWS CloudFormation Resource Coverage Updates to Amazon ElastiCache. We announced Additional Resource Metadata for Amazon EC2 Container Registry. We announced that AWS GovCloud (US) now Supports Amazon EBS Encrypted Boot Volumes and AMI Copy. We published the Oracle Database on the AWS Cloud: Quick Start Reference Deployment. The Serverless Framework announced their official v1.0 release. Batchly examined Spot vs. On-Demand in a Highly Variable Environment. 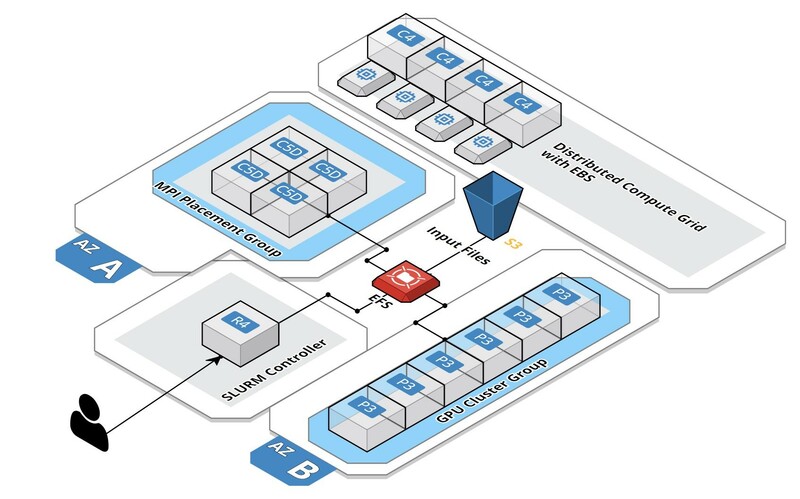 Botmetric blogged about Making Sense of the New Amazon EC2 Convertible RIs. Fugue explained Why We Built Ludwig — a DSL for the Cloud of Today and the Future. CloudHealth asked Tracking AWS Spend? Be Prepared for the Unexpected. 2nd Watch shared a First Look at Writing CloudFormation Templates in YAML. AHEAD shared An American Tourist in London: AHEAD’s Newest Amazon WorkSpaces Client Story. We announced that VMware Cloud on AWS is in the Works. We announced that you can now Use Hosted Git Repositories from AWS CodeCommit with AWS Elastic Beanstalk. We announced that AWS Service Catalog is now available in the Europe (Frankfurt) and Asia Pacific (Sydney) Regions. The AWS Compute Blog explained how Amazon ECS Service Auto Scaling Enables Rent-A-Center SAP Hybris Solution. Rowan Udell wrote about database connections in Lambda. Stuart Scott published a new Cloud Academy ebook on AWS Security Fundamentals. CloudCheckr wrote about 8 Can’t Miss Cloud Management Sessions at the Gartner Symposium. FittedCloud blogged about Machine Learning CPU Utilization for AWS EC2 Scheduling. 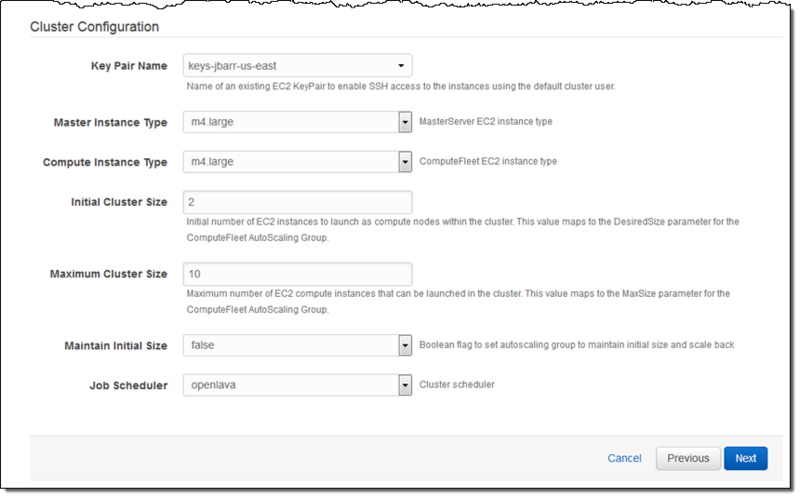 Bitmetric worked on Demystifying the New AWS Regional Benefit Scope: Making EC2 RIs AZ-Agnostic. Trek10 took A Look at Serverless GraphQL. The AWS Enterprise Blog wrote about Transitioning to DevOps and the Cloud. ironSource Atom Software Development Team Leader – Pavel Kerbel wrote about The Hitchhiker’s Guide to AWS Redshift — part 2: Let’s cut costs. Softchoicewrote a blog for CloudHealth Tech on4 benefits for SaaS startups that develop in a managed cloud..
cloudonaut.io wrote about Beyond the default: a Multi-VPC architecture. The Cloud Academy Blog wrote a post about DynamoDB vs MongoDB: a comparision. Botmetric listed the Top 5 Reasons Why AWS for Fintech is a Perfect Match. PowerupCloud shared a Serverless Way to Automate AMI Creation / Deletion Using AWS Lambda. Scott Johnson wrote four different posts on aws that all came out today including How to Use Ruby with Lambda Even Though Its Not Supported, Back to the Basics, Let’s Talk AMIs, How to Find your Web Server when You’ve Lost an AWS Resource and he wraps up his AWS SSH Tutorial with How to use Monit for Process Monitoring. og-aws is the Open Guide to AWS. intel-edison-aws-iot-alexa-voice implements voice control using the Alexa Voice Kit. bstpy exposes a Lambda function as a local HTTP endpoint. aws-s3-explorer is an S3 explorer built with Angular.js. node-aws-sqs-redriver re-drives messages from one SQS queue to another. awsm is a set of AWS automation tools. awsmDashboard is a GopherJS/React front-end for awsm. cagophilist is a toolbelt for easily managing AWS keys for CLI or SDK use. grafana-aws-cloudwatch-dashboards is a set of Grafana dashboard for CloudWatch metrics. qmuli is a way to build cloud infrastructure on AWS. Deep Dive on AWS re:Invent 2016 Breakout Sessions. Reserved Seating at AWS re:Invent 2016. Introduction to AWS for Android Developers. Getting Started with AWS Mobile Hub. Disaster Recovery and Business Continuity. Automatic Compliance Defense in the Cloud. Cloud Migration for Financial Services. AWS Webinars – October and November. October 18-20 (San Francisco, California, USA) – Database week at the AWS Loft. October 19 (Seoul, Korea) – AWS Korea User Group Monthly Seminar – Database Service. October 19 (Lyon, France) – Meetup #4 of the Lyon AWS User Group. October 20 (Wellington, New Zealand) – AWS Wellington User Group – #11 – IoT and Serverless in the Enterprise. October 24 (Lisbon, Portugal) – Meetup #1 of the Lisbon AWS User Group. October 26 (Cambridge, England) – Meetup #9 of the Cambridge AWS User Group: Everything Mobile. October 26 (Dublin, Ireland) – Meetup #16 of the AWS User Group Network in Dublin. November 8 (London, England) – AWS Enterprise Summit London. November 23 (Cardiff, Wales) – Meetup #4 of the AWS South Wales User Group. Stay tuned for next week! In the meantime, follow me on Twitter and subscribe to the RSS feed.